In the last two posts, Kubernetes-based Microservice Observability with Istio Service Mesh and Azure Kubernetes Service (AKS) Observability with Istio Service Mesh, we explored the observability tools which are included with Istio Service Mesh. 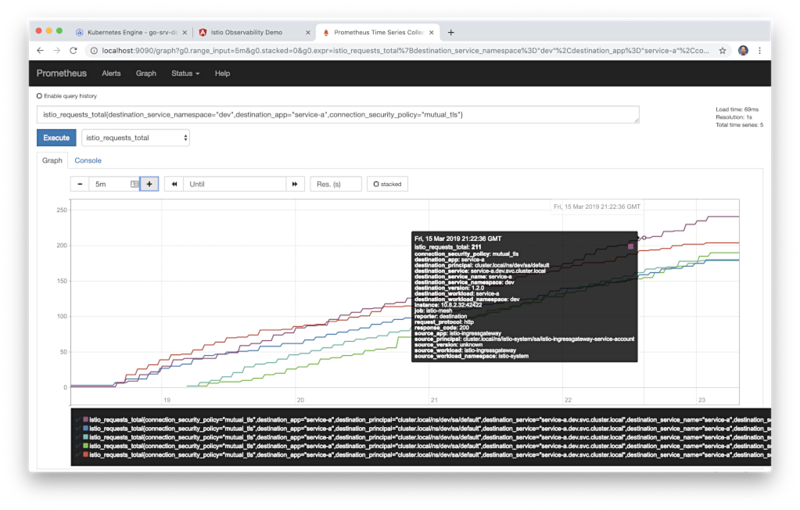 These tools currently include Prometheus and Grafana for metric collection, monitoring, and alerting, Jaeger for distributed tracing, and Kiali for Istio service-mesh-based microservice visualization and monitoring. 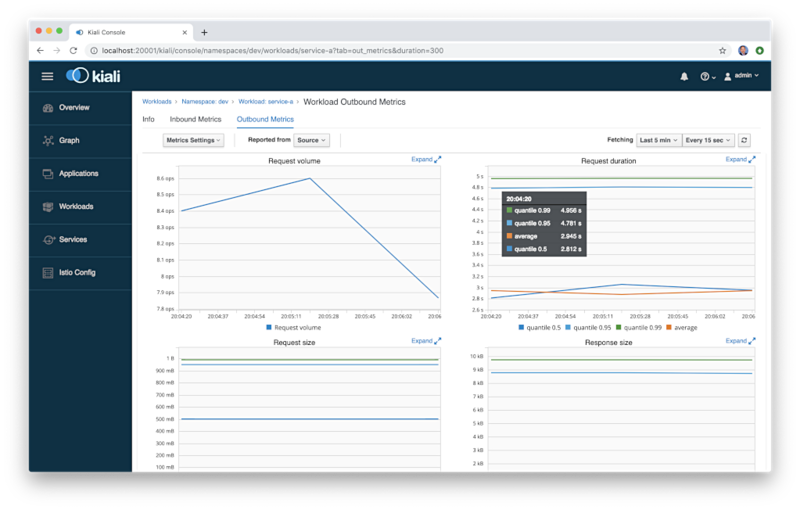 Combined with cloud platform-native monitoring and logging services, such as Stackdriver on GCP, CloudWatch on AWS, Azure Monitor logs on Azure, and we have a complete observability solution for modern, distributed, Cloud-based applications. According to the gRPC project, gRPC, a CNCF incubating project, is a modern, high-performance, open-source and universal remote procedure call (RPC) framework that can run anywhere. It enables client and server applications to communicate transparently and makes it easier to build connected systems. Google, the original developer of gRPC, has used the underlying technologies and concepts in gRPC for years. The current implementation is used in several Google cloud products and Google externally facing APIs. It is also being used by Square, Netflix, CoreOS, Docker, CockroachDB, Cisco, Juniper Networks and many other organizations. By default, gRPC uses Protocol Buffers. According to Google, protocol buffers are a language- and platform-neutral, efficient, extensible, automated mechanism for serializing structured data for use in communications protocols, data storage, and more. Protocol Buffers are 3 to 10 times smaller and 20 to 100 times faster than XML. Compiling source protocol buffers .proto file using generate data access classes that are easier to use programmatically. Protocol Buffers are 3 to 10 times smaller and 20 to 100 times faster than XML. Protocol buffers currently support generated code in Java, Python, Objective-C, and C++, Dart, Go, Ruby, and C#. For this post, we have compiled for Go. 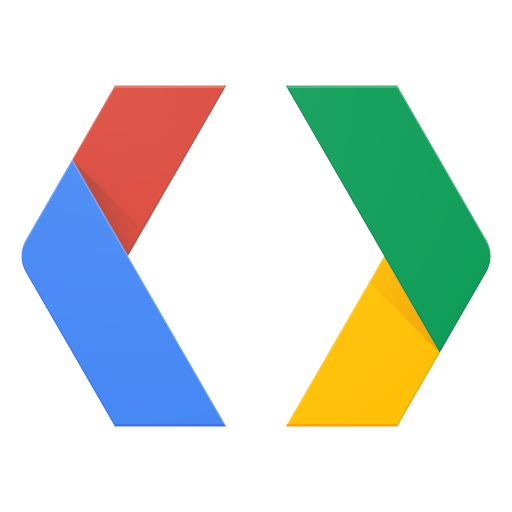 You can read more about the binary wire format of Protobuf on Google’s Developers Portal. According to the Istio project, Istio uses an extended version of the Envoy proxy. Envoy is deployed as a sidecar to a relevant service in the same Kubernetes pod. Envoy, created by Lyft, is a high-performance proxy developed in C++ to mediate all inbound and outbound traffic for all services in the service mesh. Istio leverages Envoy’s many built-in features, including dynamic service discovery, load balancing, TLS termination, HTTP/2 and gRPC proxies, circuit-breakers, health checks, staged rollouts, fault injection, and rich metrics. According to the post by Harvey Tuch of Google, Evolving a Protocol Buffer canonical API, Envoy proxy adopted Protocol Buffers, specifically proto3, as the canonical specification of for version 2 of Lyft’s gRPC-first API. 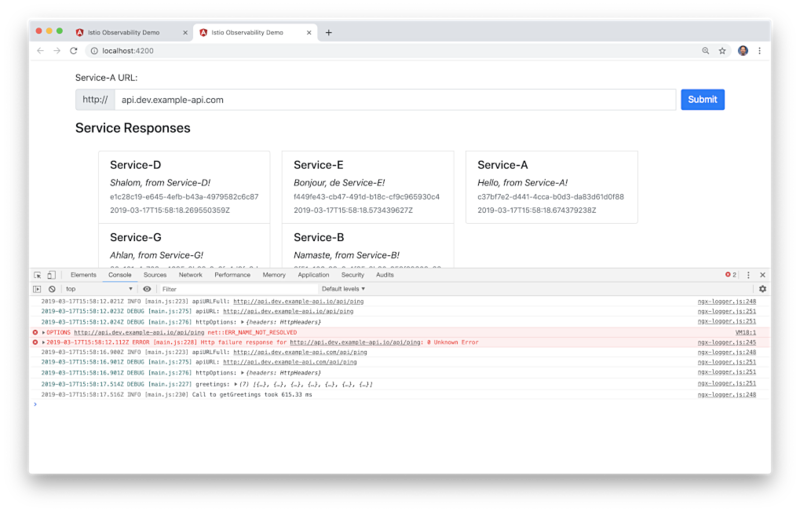 In the last two posts, we explored Istio’s observability tools, using a RESTful microservices-based API platform written in Go and using JSON over HTTP for service to service communications. The API platform was comprised of eight Go-based microservices and one sample Angular 7, TypeScript-based front-end web client. The various services are dependent on MongoDB, and RabbitMQ for event queue-based communications. Below, the is JSON over HTTP-based platform architecture. Below, the current Angular 7-based web client interface. For this post, I have modified the eight Go microservices to use gRPC and Protocol Buffers, Google’s data interchange format. Specifically, the services use version 3 release (aka proto3) of Protocol Buffers. With gRPC, a gRPC client calls a gRPC server. Some of the platform’s services are gRPC servers, others are gRPC clients, while some act as both client and server, such as Service A, B, and E. The revised architecture is shown below. Assuming for the sake of this demonstration, that most consumers of the API would still expect to communicate using a RESTful JSON over HTTP API, I have added a gRPC Gateway reverse proxy to the platform. The gRPC Gateway is a gRPC to JSON reverse proxy, a common architectural pattern, which proxies communications between the JSON over HTTP-based clients and the gRPC-based microservices. 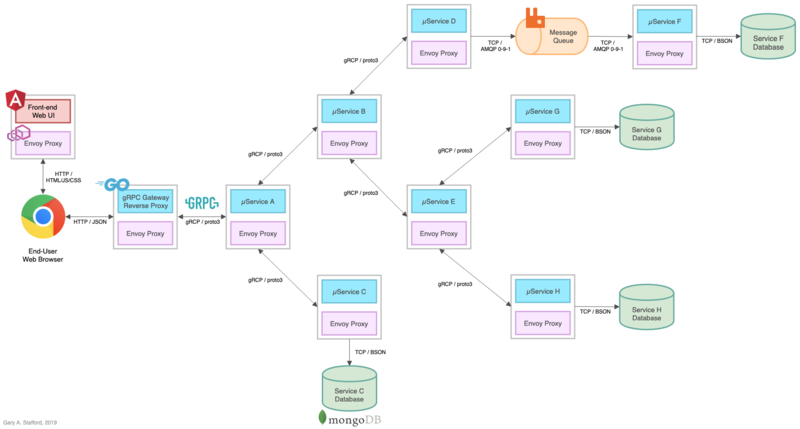 A diagram from the grpc-gateway GitHub project site effectively demonstrates how the reverse proxy works. In the revised platform architecture diagram above, note the addition of the reverse proxy, which replaces Service A at the edge of the API. The proxy sits between the Angular-based Web UI and Service A. Also, note the communication method between services is now Protobuf over gRPC instead of JSON over HTTP. 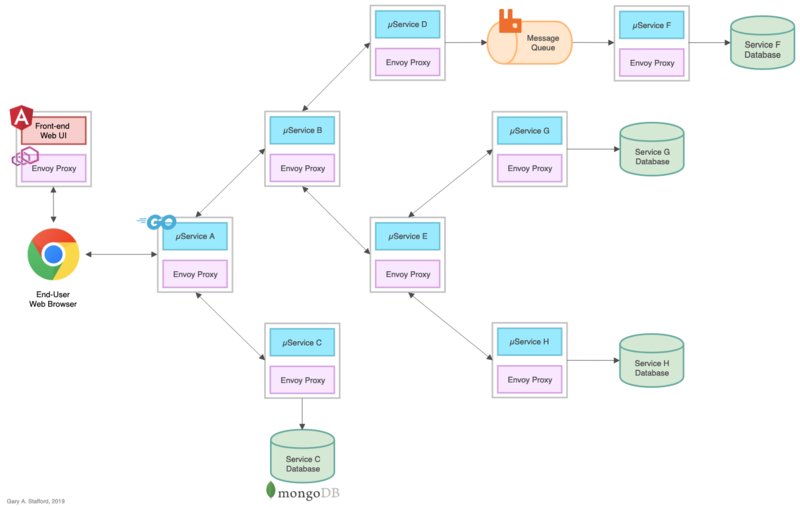 The use of Envoy Proxy (via Istio) is unchanged, as is the MongoDB Atlas-based databases and CloudAMQP RabbitMQ-based queue, which are still external to the Kubernetes cluster. As an alternative to the gRPC Gateway reverse proxy, we could convert the TypeScript-based Angular UI client to gRPC and Protocol Buffers, and continue to communicate directly with Service A as the edge service. However, this would limit other consumers of the API to rely on gRPC as opposed to JSON over HTTP, unless we also chose to expose two different endpoints, gRPC, and JSON over HTTP, another common pattern. 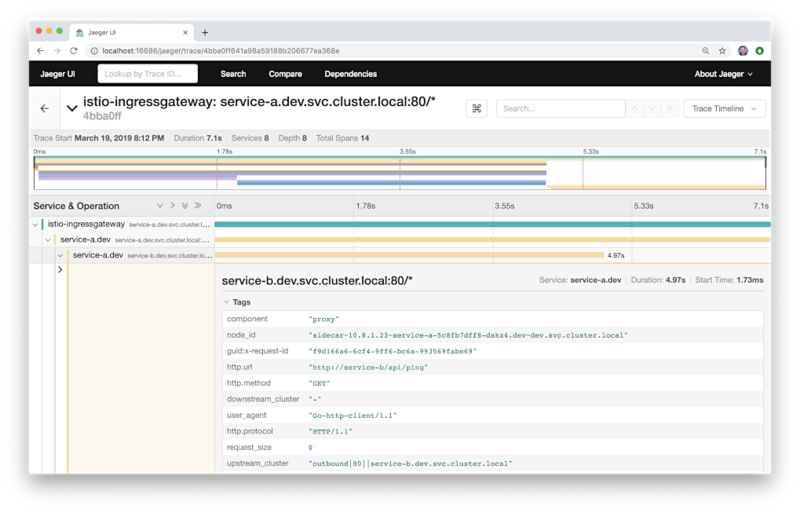 In this post’s demonstration, we will repeat the exact same installation process, outlined in the previous post, Kubernetes-based Microservice Observability with Istio Service Mesh. We will deploy the revised gRPC-based platform to GKE on GCP. You could just as easily follow Azure Kubernetes Service (AKS) Observability with Istio Service Mesh, and deploy the platform to AKS. All source code for this post is available on GitHub, contained in three projects. The Go-based microservices source code, all Kubernetes resources, and all deployment scripts are located in the k8s-istio-observe-backend project repository, in the new grpc branch. The Angular-based web client source code is located in the k8s-istio-observe-frontend repository on the new grpc branch. The source protocol buffers .proto file and the generated code, using the protocol buffers compiler, is located in the new pb-greeting project repository. You do not need to clone either of these projects for this post’s demonstration. All Docker images for the services, UI, and the reverse proxy are located on Docker Hub. This post is not specifically about writing Go for gRPC and Protobuf. However, to better understand the observability requirements and capabilities of these technologies, compared to JSON over HTTP, it is helpful to review some of the source code. First, compare the source code for Service A, shown below, to the original code in the previous post. The service’s code is almost completely re-written. I relied on several references for writing the code, including, Tracing gRPC with Istio, written by Neeraj Poddar of Aspen Mesh and Distributed Tracing Infrastructure with Jaeger on Kubernetes, by Masroor Hasan. Shown below is the greeting source protocol buffers .proto file. The greeting response struct, originally defined in the services, remains largely unchanged (gist). The UI client responses will look identical. When compiled with protoc, the Go-based protocol compiler plugin, the original 27 lines of source code swells to almost 270 lines of generated data access classes that are easier to use programmatically. Below is a small snippet of that compiled code, for reference. The compiled code is included in the pb-greeting project on GitHub and imported into each microservice and the reverse proxy (gist). We also compile a separate version for the reverse proxy to implement. Using Swagger, we can view the greeting protocol buffers’ single RESTful API resource, exposed with an HTTP GET method. 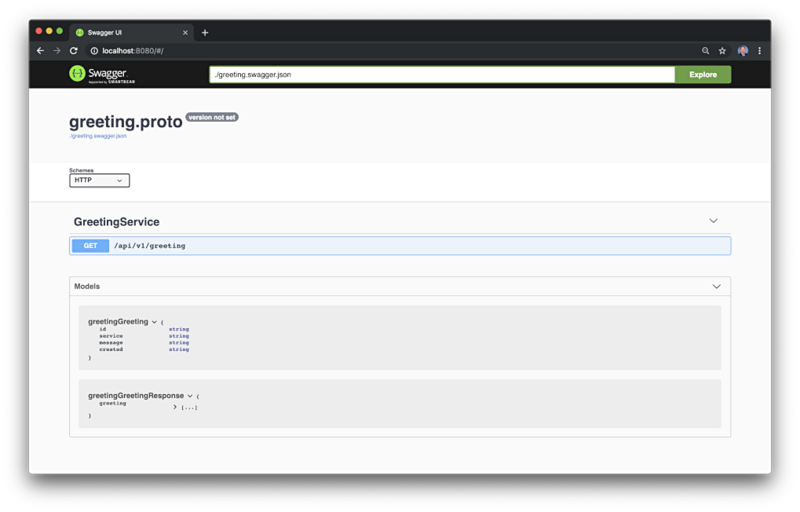 I use the Docker-based version of Swagger UI for viewing protoc generated swagger definitions. The Angular UI makes an HTTP GET request to the /api/v1/greeting resource, which is transformed to gRPC and proxied to Service A, where it is handled by the Greeting function. Below, in the Stackdriver logs, we see an example of a set of HTTP request headers in the JSON payload, which are propagated upstream to gRPC-based Go services from the gRPC Gateway’s reverse proxy. Header propagation ensures the request produces a complete distributed trace across the complete service call chain. To deploy the microservices platform to GKE, follow the detailed instructions in part one of the post, Kubernetes-based Microservice Observability with Istio Service Mesh: Part 1, or Azure Kubernetes Service (AKS) Observability with Istio Service Mesh for AKS. As introduced in the first post, logs, metrics, and traces are often known as the three pillars of observability. These are the external outputs of the system, which we may observe. As modern distributed systems grow ever more complex, the ability to observe those systems demands equally modern tooling that was designed with this level of complexity in mind. Traditional logging and monitoring systems often struggle with today’s hybrid and multi-cloud, polyglot language-based, event-driven, container-based and serverless, infinitely-scalable, ephemeral-compute platforms. Tools like Istio Service Mesh attempt to solve the observability challenge by offering native integrations with several best-of-breed, open-source telemetry tools. Istio’s integrations include Jaeger for distributed tracing, Kiali for Istio service mesh-based microservice visualization and monitoring, and Prometheus and Grafana for metric collection, monitoring, and alerting. 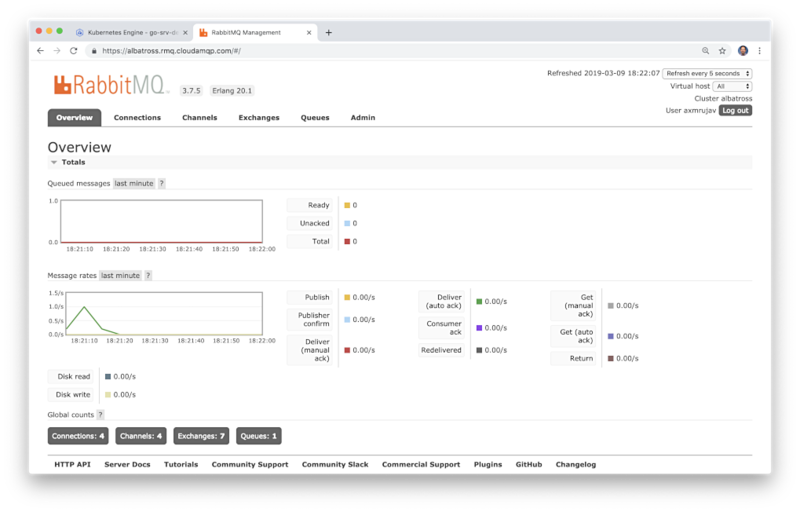 Combined with cloud platform-native monitoring and logging services, such as Stackdriver for GKE, CloudWatch for Amazon’s EKS, or Azure Monitor logs for AKS, and we have a complete observability solution for modern, distributed, Cloud-based applications. Moving from JSON over HTTP to gRPC does not require any changes to the logging configuration of the Go-based service code or Kubernetes resources. As detailed in part two of the last post, Kubernetes-based Microservice Observability with Istio Service Mesh, our logging strategy for the eight Go-based microservices and the reverse proxy continues to be the use of Logrus, the popular structured logger for Go, and Banzai Cloud’s logrus-runtime-formatter. If you recall, the Banzai formatter automatically tags log messages with runtime/stack information, including function name and line number; extremely helpful when troubleshooting. We are also using Logrus’ JSON formatter. Below, in the Stackdriver console, note how each log entry below has the JSON payload contained within the message with the log level, function name, lines on which the log entry originated, and the message. Below, we see the details of a specific log entry’s JSON payload. In this case, we can see the request headers propagated from the downstream service. Moving from JSON over HTTP to gRPC does not require any changes to the metrics configuration of the Go-based service code or Kubernetes resources. Prometheus is a completely open source and community-driven systems monitoring and alerting toolkit originally built at SoundCloud, circa 2012. Interestingly, Prometheus joined the Cloud Native Computing Foundation (CNCF) in 2016 as the second hosted-project, after Kubernetes. Grafana describes itself as the leading open source software for time series analytics. 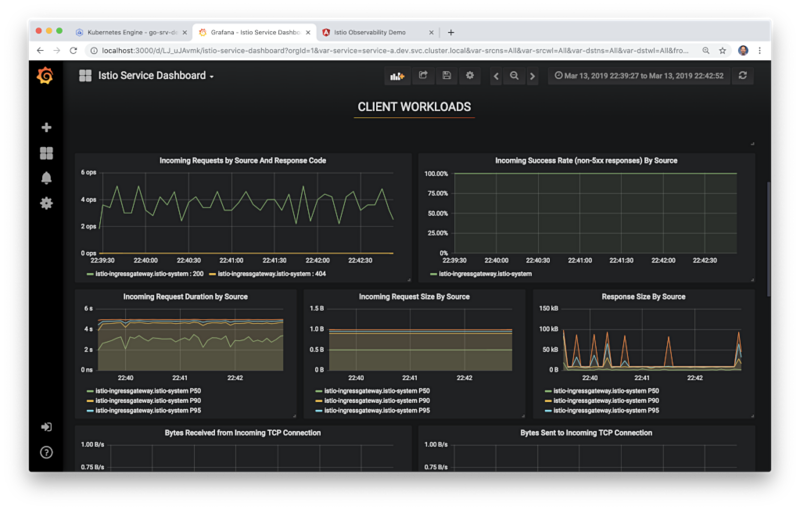 According to Grafana Labs, Grafana allows you to query, visualize, alert on, and understand your metrics no matter where they are stored. You can easily create, explore, and share visually-rich, data-driven dashboards. Grafana allows users to visually define alert rules for your most important metrics. Grafana will continuously evaluate rules and can send notifications. According to Istio, the Grafana add-on is a pre-configured instance of Grafana. 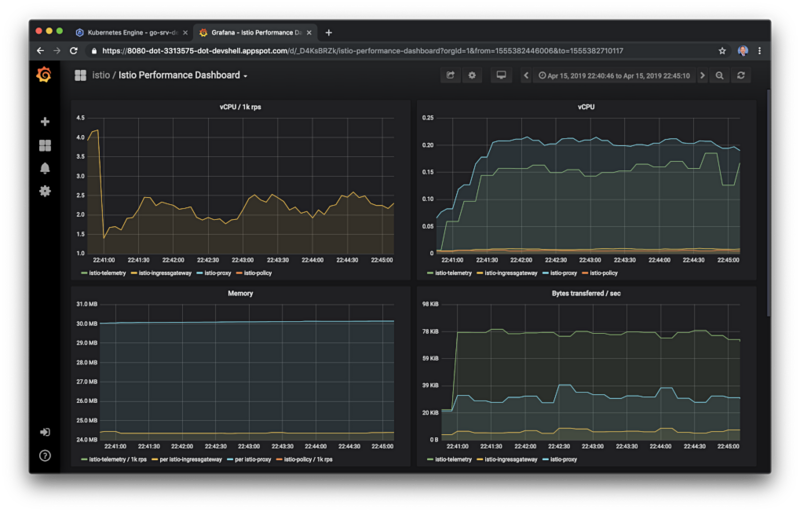 The Grafana Docker base image has been modified to start with both a Prometheus data source and the Istio Dashboard installed. Below, we see two of the pre-configured dashboards, the Istio Mesh Dashboard and the Istio Performance Dashboard. Moving from JSON over HTTP to gRPC did require a complete re-write of the tracing logic in the service code. In fact, I spent the majority of my time ensuring the correct headers were propagated from the Istio Ingress Gateway to the gRPC Gateway reverse proxy, to Service A in the gRPC context, and upstream to all the dependent, gRPC-based services. I am sure there are a number of optimization in my current code, regarding the correct handling of traces and how this information is propagated across the service call stack. According to their website, Jaeger, inspired by Dapper and OpenZipkin, is a distributed tracing system released as open source by Uber Technologies. It is used for monitoring and troubleshooting microservices-based distributed systems, including distributed context propagation, distributed transaction monitoring, root cause analysis, service dependency analysis, and performance and latency optimization. The Jaeger website contains an excellent overview of Jaeger’s architecture and general tracing-related terminology. Below we see the Jaeger UI Traces View. In it, we see a series of traces generated by hey, a modern load generator and benchmarking tool, and a worthy replacement for Apache Bench (ab). Unlike ab, hey supports HTTP/2. The use of hey was detailed in the previous post. A trace, as you might recall, is an execution path through the system and can be thought of as a directed acyclic graph (DAG) of spans. If you have worked with systems like Apache Spark, you are probably already familiar with DAGs. Below we see the Jaeger UI Trace Detail View. The example trace contains 16 spans, which encompasses nine components – seven of the eight Go-based services, the reverse proxy, and the Istio Ingress Gateway. The trace and the spans each have timings. The root span in the trace is the Istio Ingress Gateway. In this demo, traces do not span the RabbitMQ message queues. This means you would not see a trace which includes the decoupled, message-based communications between Service D to Service F, via the RabbitMQ. Within the Jaeger UI Trace Detail View, you also have the ability to drill into a single span, which contains additional metadata. Metadata includes the URL being called, HTTP method, response status, and several other headers. Moving from JSON over HTTP to gRPC does not require any changes to the Kiali configuration of the Go-based service code or Kubernetes resources. 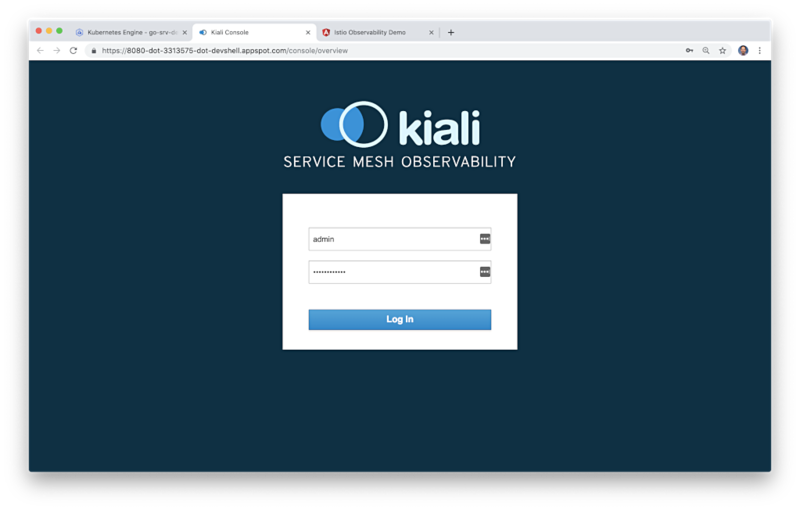 According to their website, Kiali provides answers to the questions: What are the microservices in my Istio service mesh, and how are they connected? 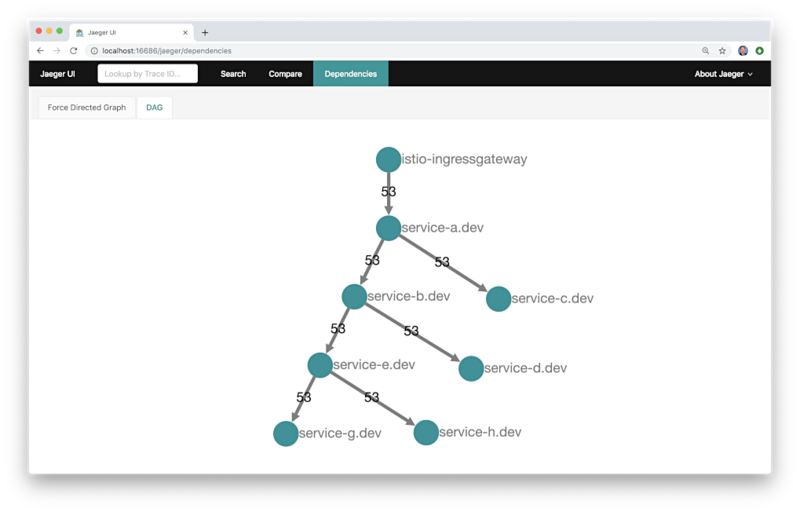 Kiali works with Istio, in OpenShift or Kubernetes, to visualize the service mesh topology, to provide visibility into features like circuit breakers, request rates and more. It offers insights about the mesh components at different levels, from abstract Applications to Services and Workloads. 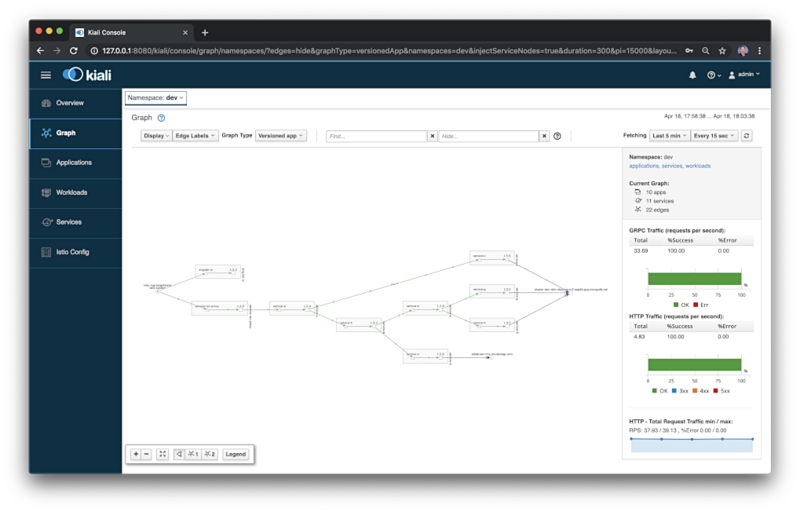 The Graph View in the Kiali UI is a visual representation of the components running in the Istio service mesh. Below, filtering on the cluster’s dev Namespace, we should observe that Kiali has mapped all components in the platform, along with rich metadata, such as their version and communication protocols. Using Kiali, we can confirm our service-to-service IPC protocol is now gRPC instead of the previous HTTP. Although converting from JSON over HTTP to protocol buffers with gRPC required major code changes to the services, it did not impact the high-level observability we have of those services using the tools provided by Istio, including Prometheus, Grafana, Jaeger, and Kiali. All opinions expressed in this post are my own and not necessarily the views of my current or past employers or their clients. 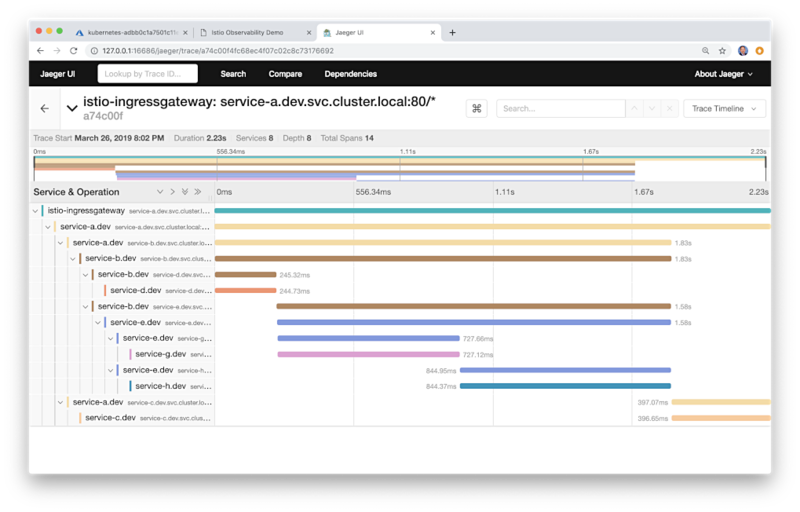 In the last two-part post, Kubernetes-based Microservice Observability with Istio Service Mesh, we deployed Istio, along with its observability tools, Prometheus, Grafana, Jaeger, and Kiali, to Google Kubernetes Engine (GKE). Following that post, I received several questions about using Istio’s observability tools with other popular managed Kubernetes platforms, primarily Azure Kubernetes Service (AKS). In most cases, including with AKS, both Istio and the observability tools are compatible. In this short follow-up of the last post, we will replace the GKE-specific cluster setup commands, found in part one of the last post, with new commands to provision a similar AKS cluster on Azure. 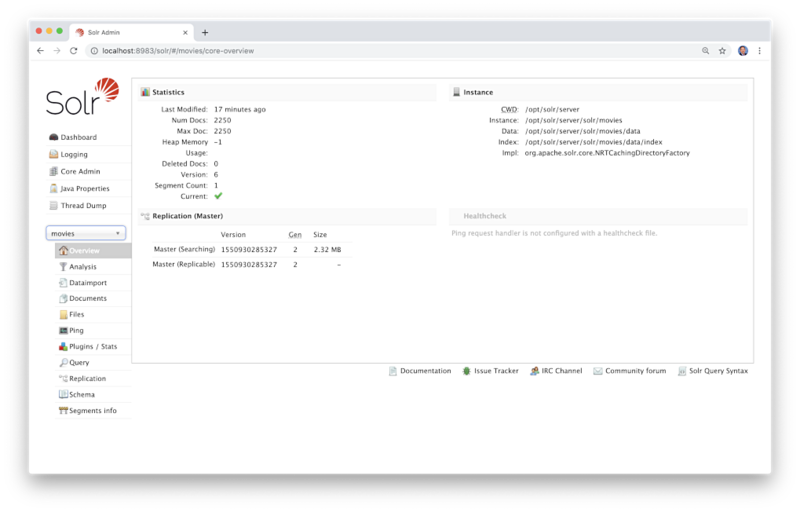 The new AKS cluster will run Istio 1.1.3, released 4/15/2019, alongside the latest available version of AKS (Kubernetes), 1.12.6. We will replace Google’s Stackdriver logging with Azure Monitor logs. We will retain the external MongoDB Atlas cluster and the external CloudAMQP cluster dependencies. Previous articles about AKS include First Impressions of AKS, Azure’s New Managed Kubernetes Container Service (November 2017) and Architecting Cloud-Optimized Apps with AKS (Azure’s Managed Kubernetes), Azure Service Bus, and Cosmos DB (December 2017). All source code for this post is available on GitHub in two projects. The Go-based microservices source code, all Kubernetes resources, and all deployment scripts are located in the k8s-istio-observe-backend project repository. The Angular UI TypeScript-based source code is located in the k8s-istio-observe-frontend repository. You will not need to clone the Angular UI project for this post’s demonstration. 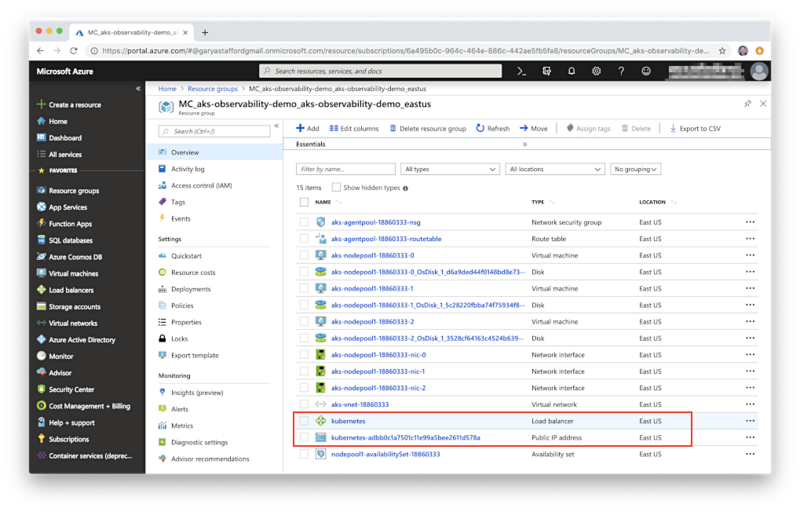 This post assumes you have a Microsoft Azure account with the necessary resource providers registered, and the Azure Command-Line Interface (CLI), az, installed and available to your command shell. You will also need Helm and Istio 1.1.3 installed and configured, which is covered in the last post. Start by logging into Azure from your command shell. If you are new to Azure or AKS, you may need to register some additional resource providers to complete this demonstration. If you are missing required resource providers, you will see errors similar to the one shown below. Simply activate the particular provider corresponding to the error. Operation failed with status:'Bad Request'. To register the necessary providers, use the Azure CLI or the Azure Portal UI. AKS requires an Azure Resource Group. According to Azure, a resource group is a container that holds related resources for an Azure solution. The resource group includes those resources that you want to manage as a group. I chose to create a new resource group associated with my closest geographic Azure Region, East US, using the Azure CLI. Before creating the GKE cluster, check for the latest versions of AKS. At the time of this post, the latest versions of AKS was 1.12.6. Using the latest GKE version, create the GKE managed cluster. There are many configuration options available with the az aks create command. For this post, I am creating three worker nodes using the Azure Standard_DS3_v2 VM type, which will give us a total of 12 vCPUs and 42 GB of memory. Anything smaller and all the Pods may not be schedulable. Instead of supplying an existing SSH key, I will let Azure create a new one. You should have no need to SSH into the worker nodes. I am also enabling the monitoring add-on. According to Azure, the add-on sets up Azure Monitor for containers, announced in December 2018, which monitors the performance of workloads deployed to Kubernetes environments hosted on AKS. Using the time command, we observe that the cluster took approximately 5m48s to provision; I have seen times up to almost 10 minutes. AKS provisioning is not as fast as GKE, which in my experience is at least 2x-3x faster than AKS for a similarly sized cluster. After the cluster creation completes, retrieve your AKS cluster credentials. Use the following command to confirm the cluster is ready by examining the status of three worker nodes. Observe that Azure currently uses Ubuntu 16.04.5 LTS for the worker node’s host operating system. If you recall, GKE offers both Ubuntu as well as a Container-Optimized OS from Google. Unlike GKE, there is no custom AKS dashboard. Therefore, we will use the Kubernetes Web UI (dashboard), which is installed by default with AKS, unlike GKE. According to Azure, to make full use of the dashboard, since the AKS cluster uses RBAC, a ClusterRoleBinding must be created before you can correctly access the dashboard. Next, we must create a proxy tunnel on local port 8001 to the dashboard running on the AKS cluster. 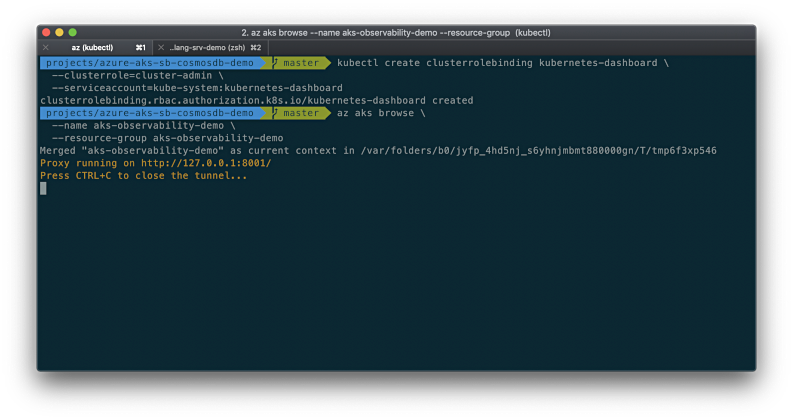 This CLI command creates a proxy between your local system and the Kubernetes API and opens your web browser to the Kubernetes dashboard. Although you should use the Azure CLI, PowerShell, or SDK for all your AKS configuration tasks, using the dashboard for monitoring the cluster and the resources running on it, is invaluable. The Kubernetes dashboard also provides access to raw container logs. Azure Monitor provides the ability to construct complex log queries, but for quick troubleshooting, you may just want to see the raw logs a specific container is outputting, from the dashboard. Logging into the Azure Portal, we can observe the AKS cluster, within the new Resource Group. In addition to the Azure Resource Group we created, there will be a second Resource Group created automatically during the creation of the AKS cluster. This group contains all the resources that compose the AKS cluster. These resources include the three worker node VM instances, and their corresponding storage disks and NICs. The group also includes a network security group, route table, virtual network, and an availability set. From this point on, the process to deploy Istio Service Mesh and the Go-based microservices platform follows the previous post and use the exact same scripts. After modifying the Kubernetes resource files, to deploy Istio, use the bash script, part4_install_istio.sh. I have added a few more pauses in the script to account for the apparently slower response times from AKS as opposed to GKE. It definitely takes longer to spin up the Istio resources on AKS than on GKE, which can result in errors if you do not pause between each stage of the deployment process. Using the Kubernetes dashboard, we can view the Istio resources running in the istio-system Namespace, as shown below. Confirm that all resource Pods are running and healthy before deploying the Go-based microservices platform. 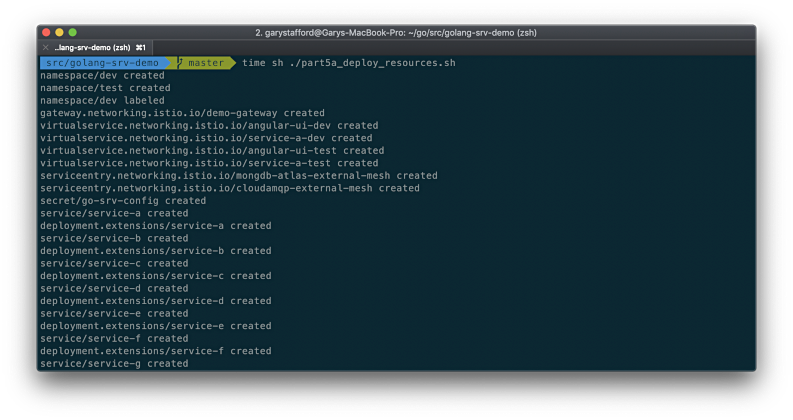 Deploy the Go-based microservices platform, using bash deploy script, part5a_deploy_resources.sh. The script deploys two replicas (Pods) of each of the eight microservices, Service-A through Service-H, and the Angular UI, to the dev and test Namespaces, for a total of 36 Pods. Each Pod will have the Istio sidecar proxy (Envoy Proxy) injected into it, alongside the microservice or UI. If we return to the Resource Group created automatically when the AKS cluster was created, we will now see two additional resources. There is now an Azure Load Balancer and Public IP Address. 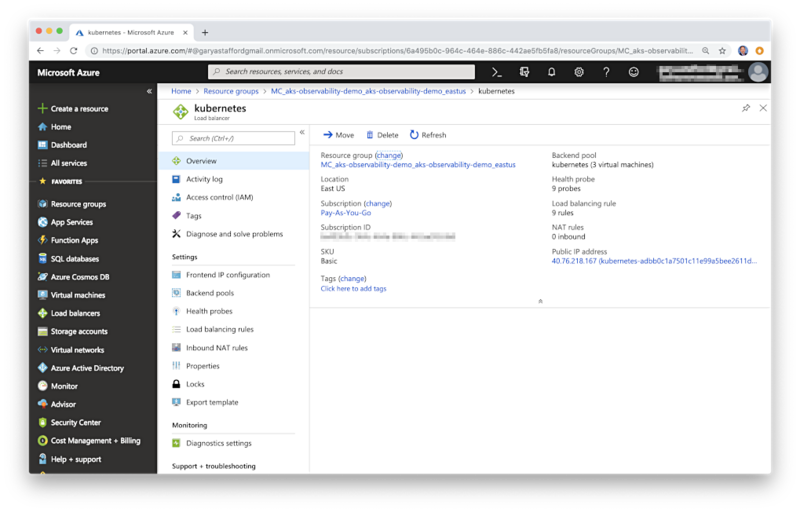 Similar to the GKE cluster in the last post, when the Istio Ingress Gateway is deployed as part of the platform, it is materialized as an Azure Load Balancer. The front-end of the load balancer is the new public IP address. The back-end of the load-balancer is a pool containing the three AKS worker node VMs. The load balancer is associated with a set of rules and health probes. I have associated the new Azure public IP address, connected with the front-end of the load balancer, with the four subdomains I am using to represent the UI and the edge service, Service-A, in both Namespaces. If Azure is your primary Cloud provider, then Azure DNS is a good choice to manage your domain’s DNS records. For this demo, you will require your own domain. With everything deployed, test the platform is responding and generate HTTP traffic for the observability tools to record. Similar to last time, I have chosen hey, a modern load generator and benchmarking tool, and a worthy replacement for Apache Bench (ab). Unlike ab, hey supports HTTP/2. Below, I am running hey directly from Azure Cloud Shell. The tool is simulating 10 concurrent users, generating a total of 500 HTTP GET requests to Service A. We had 100% success with all 500 calls resulting in an HTTP 200 OK success status response code. Based on the results, we can observe the platform was capable of approximately 4 requests/second, with an average response time of 2.48 seconds and a mean time of 2.80 seconds. Almost all of that time was the result of waiting for the response, as the details indicate. In this post, we have replaced GCP’s Stackdriver logging with Azure Monitor logs. According to Microsoft, Azure Monitor maximizes the availability and performance of applications by delivering a comprehensive solution for collecting, analyzing, and acting on telemetry from Cloud and on-premises environments. In my opinion, Stackdriver is a superior solution for searching and correlating the logs of distributed applications running on Kubernetes. I find the interface and query language of Stackdriver easier and more intuitive than Azure Monitor, which although powerful, requires substantial query knowledge to obtain meaningful results. For example, here is a query to view the log entries from the services in the dev Namespace, within the last day. 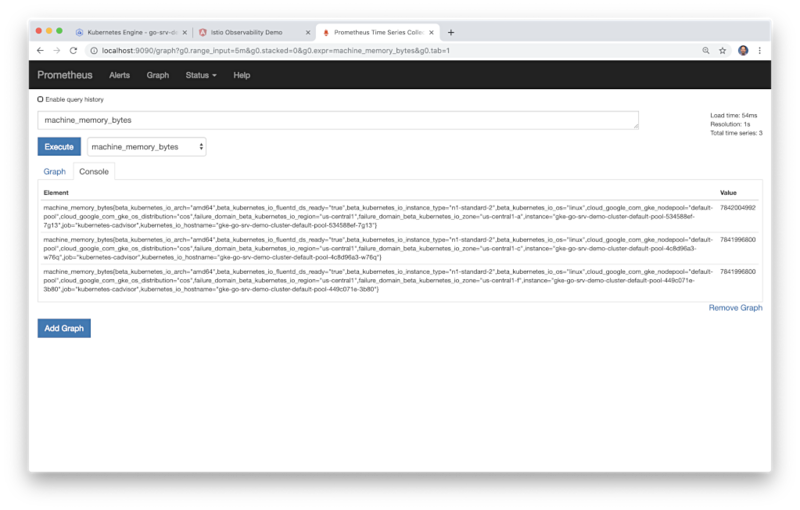 | where ClusterName =~ "aks-observability-demo"
| where Namespace == "dev"
| where Name contains "service-"
Below, we see the Logs interface with the search query and log entry results. Below, we see a detailed view of a single log entry from Service A. The previous post goes into greater detail on the features of each of the observability tools provided by Istio, including Prometheus, Grafana, Jaeger, and Kiali. We can use the exact same kubectl port-forward commands to connect to the tools on AKS as we did on GKE. According to Google, Kubernetes port forwarding allows using a resource name, such as a service name, to select a matching pod to port forward to since Kubernetes v1.10. We forward a local port to a port on the tool’s pod. Grafana describes itself as the leading open source software for time series analytics. According to Grafana Labs, Grafana allows you to query, visualize, alert on, and understand your metrics no matter where they are stored. You can easily create, explore, and share visually-rich, data-driven dashboards. Grafana also users to visually define alert rules for your most important metrics. 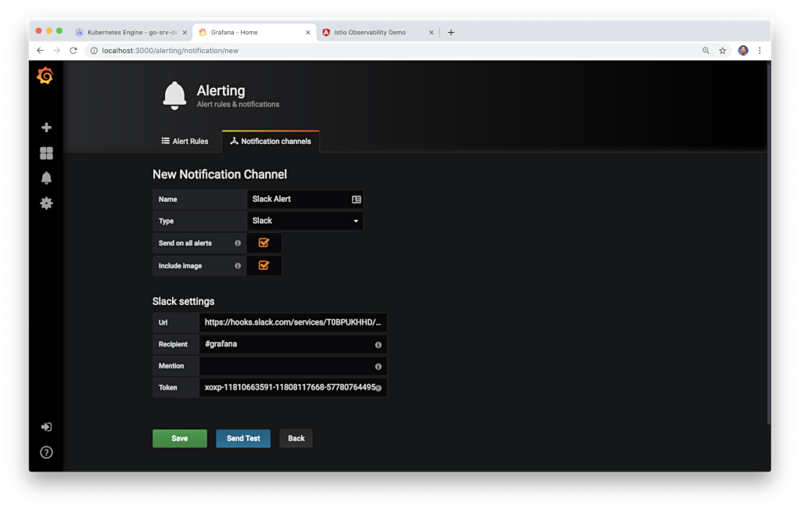 Grafana will continuously evaluate rules and can send notifications. According to Istio, the Grafana add-on is a pre-configured instance of Grafana. The Grafana Docker base image has been modified to start with both a Prometheus data source and the Istio Dashboard installed. 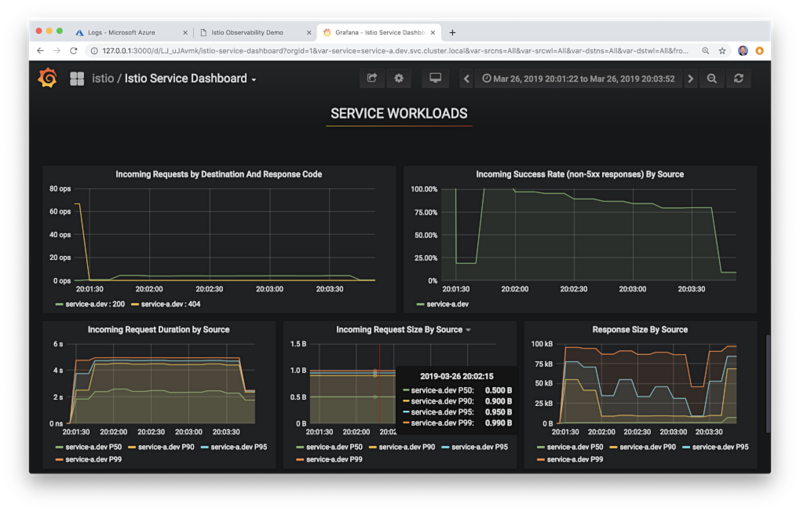 Below, we see one of the pre-configured dashboards, the Istio Service Dashboard. According to their website, Jaeger, inspired by Dapper and OpenZipkin, is a distributed tracing system released as open source by Uber Technologies. It is used for monitoring and troubleshooting microservices-based distributed systems, including distributed context propagation, distributed transaction monitoring, root cause analysis, service dependency analysis, and performance and latency optimization. The Jaeger website contains a good overview of Jaeger’s architecture and general tracing-related terminology. Below, we see a typical, distributed trace of the services, starting ingress gateway and passing across the upstream service dependencies. There is a common Kubernetes Secret that controls access to the Kiali API and UI. The default login is admin, the password is 1f2d1e2e67df. Below, we see a detailed view of our platform, running in the dev namespace, on AKS. Once you are finished with this demo, use the following two commands to tear down the AKS cluster and remove the cluster context from your local configuration. In this brief, follow-up post, we have explored how the current set of observability tools, part of the latest version of Istio Service Mesh, integrates with Azure Kubernetes Service (AKS). In this two-part post, we are exploring the set of observability tools that are part of the latest version of Istio Service Mesh. 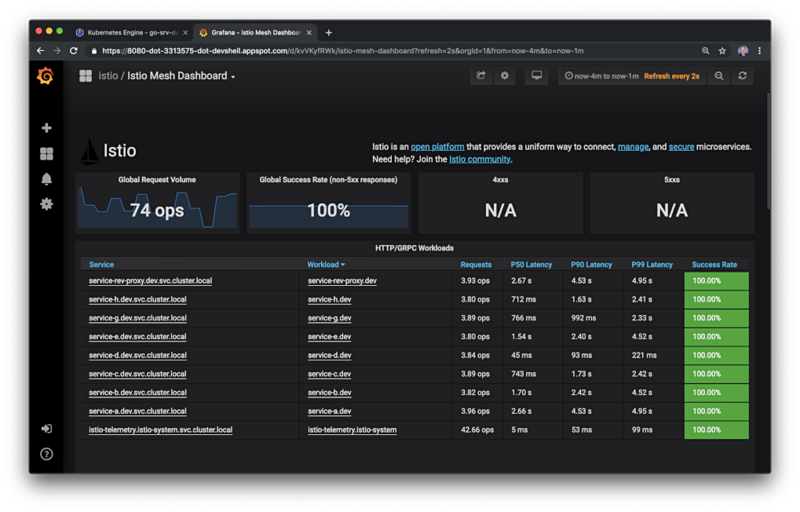 These tools include Prometheus and Grafana for metric collection, monitoring, and alerting, Jaeger for distributed tracing, and Kiali for Istio service-mesh-based microservice visualization. Combined with cloud platform-native monitoring and logging services, such as Stackdriver for Google Kubernetes Engine (GKE) on Google Cloud Platform (GCP), we have a complete observability solution for modern, distributed applications. 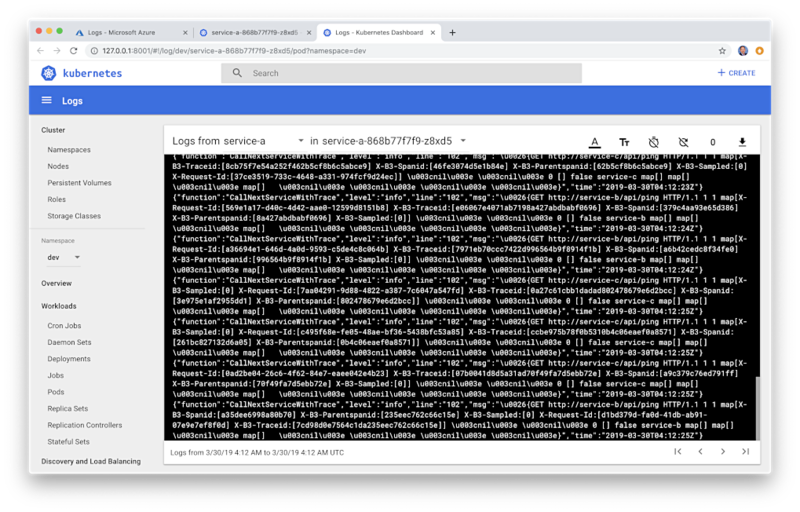 To demonstrate Istio’s observability tools, in part one of the post, we deployed a reference microservices platform, written in Go, to GKE on GCP. The platform is comprised of (14) components, including (8) Go-based microservices, labeled generically as Service A through Service H, (1) Angular 7, TypeScript-based front-end, (4) MongoDB databases, and (1) RabbitMQ queue for event queue-based communications. The reference platform is designed to generate HTTP-based service-to-service, TCP-based service-to-database (MongoDB), and TCP-based service-to-queue-to-service (RabbitMQ) IPC (inter-process communication). Service A calls Service B and Service C, Service B calls Service D and Service E, Service D produces a message on a RabbitMQ queue that Service F consumes and writes to MongoDB, and so on. The goal is to observe these distributed communications using Istio’s observability tools when the system is deployed to Kubernetes. If you recall, logs, metrics, and traces are often known as the three pillars of observability. Since we are using GKE on GCP, we will look at Google’s Stackdriver Logging. 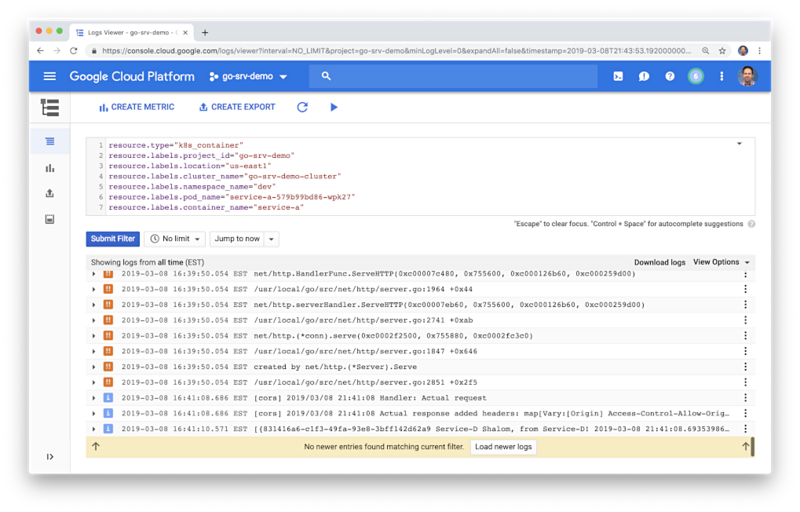 According to Google, Stackdriver Logging allows you to store, search, analyze, monitor, and alert on log data and events from GCP and even AWS. Although Stackdriver logging is not an Istio observability feature, logging is an essential pillar of overall observability strategy. An effective logging strategy starts with what you log, when you log, and how you log. As part of our logging strategy, the eight Go-based microservices are using Logrus, a popular structured logger for Go. The microservices also implement Banzai Cloud’s logrus-runtime-formatter. There is an excellent article on the formatter, Golang runtime Logrus Formatter. These two logging packages give us greater control over what we log, when we log, and how we log information about our microservices. The recommended configuration of the packages is minimal. Logrus provides several advantages of over Go’s simple logging package, log. Log entries are not only for Fatal errors, nor should all verbose log entries be output in a Production environment. The post’s microservices are taking advantage of Logrus’ ability to log at seven levels: Trace, Debug, Info, Warning, Error, Fatal and Panic. We have also variabilized the log level, allowing it to be easily changed in the Kubernetes Deployment resource at deploy-time. The microservices also take advantage of Banzai Cloud’s logrus-runtime-formatter. The Banzai formatter automatically tags log messages with runtime/stack information, including function name and line number; extremely helpful when troubleshooting. We are also using Logrus’ JSON formatter. Note how each log entry below has the JSON payload contained within the message. Likewise, we have enhanced the logging of the Angular UI using NGX Logger. NGX Logger is a popular, simple logging module, currently for Angular 6 and 7. 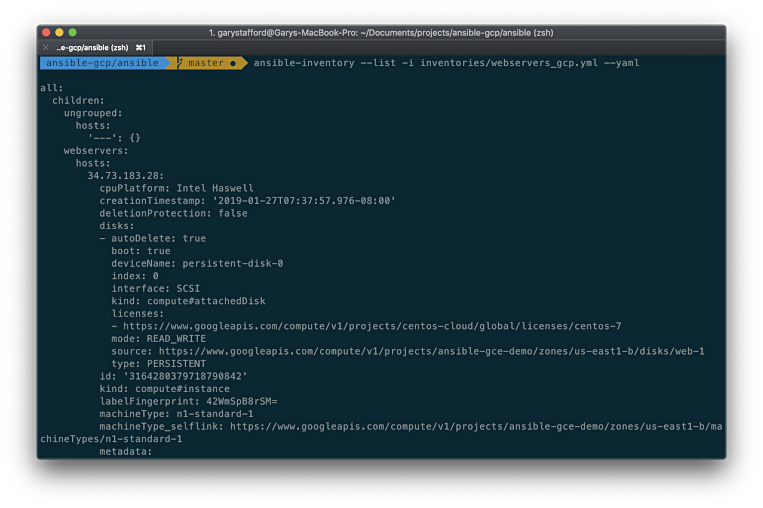 It allows “pretty print” to the console, as well as allowing log messages to be POSTed to a URL for server-side logging. For this demo, we will only print to the console. Similar to Logrus, NGX Logger supports multiple log levels: Trace, Debug, Info, Warning, Error, Fatal, and Off. Instead of just outputting messages, NGX Logger allows us to output properly formatted log entries to the web browser’s console. The level of logs output is dependent on the environment, Production or not Production. Below we see a combination of log entries in the local development environment, including Debug, Info, and Error. Again below, we see the same page in the GKE-based Production environment. Note the absence of Debug-level log entries output to the console, without changing the configuration. We would not want to expose potentially sensitive information in verbose log output to our end-users in Production. Controlling logging levels is accomplished by adding the following ternary operator to the app.module.ts file. For metrics, we will examine at Prometheus and Grafana. Both these leading tools were installed as part of the Istio deployment. According to Istio, Istio’s Mixer comes with a built-in Prometheus adapter that exposes an endpoint serving generated metric values. The Prometheus add-on is a Prometheus server that comes pre-configured to scrape Mixer endpoints to collect the exposed metrics. It provides a mechanism for persistent storage and querying of Istio metrics. 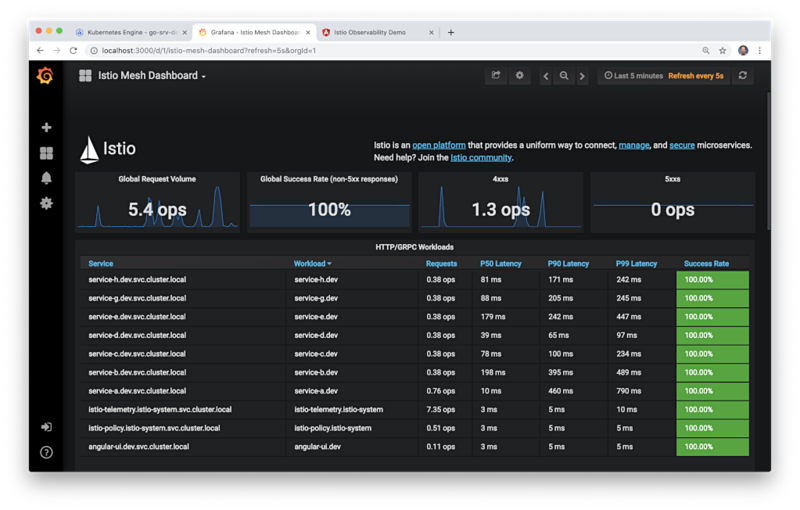 With the GKE cluster running, Istio installed, and the platform deployed, the easiest way to access Grafana, is using kubectl port-forward to connect to the Prometheus server. According to Google, Kubernetes port forwarding allows using a resource name, such as a service name, to select a matching pod to port forward to since Kubernetes v1.10. We forward a local port to a port on the Prometheus pod. 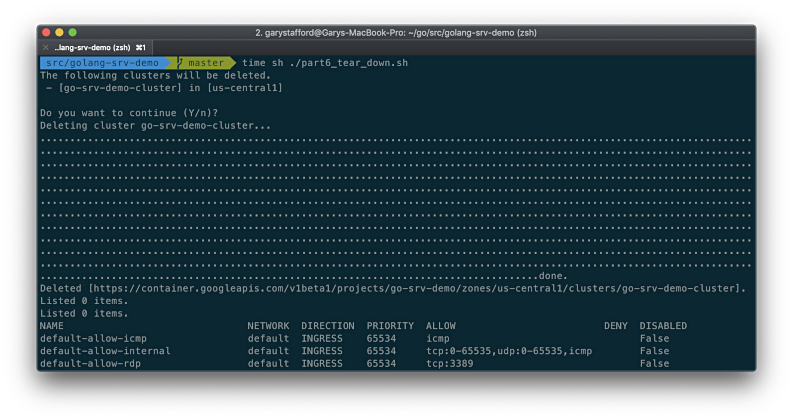 You may connect using Google Cloud Shell or copy and paste the command to your local shell to connect from a local port. Below are the port forwarding commands used in this post. According to Prometheus, user select and aggregate time series data in real time using a functional query language called PromQL (Prometheus Query Language). The result of an expression can either be shown as a graph, viewed as tabular data in Prometheus’s expression browser, or consumed by external systems through Prometheus’ HTTP API. The expression browser includes a drop-down menu with all available metrics as a starting point for building queries. Shown below are a few PromQL examples used in this post. 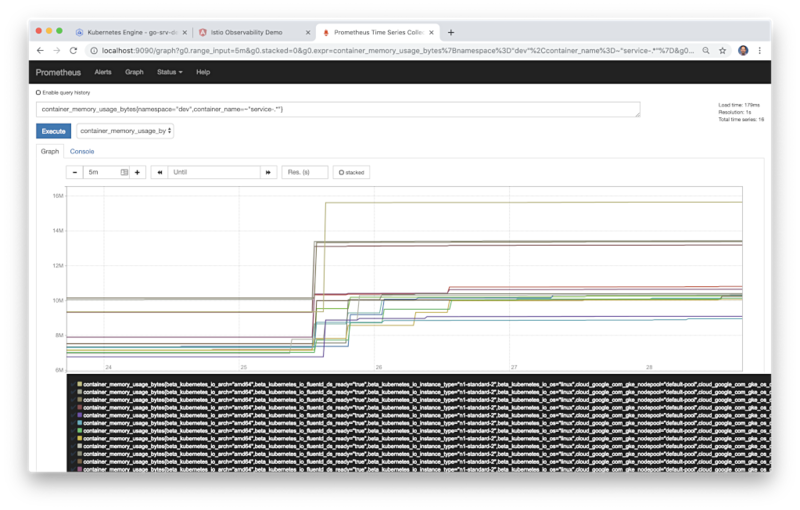 Below, in the Prometheus console, we see an example graph of the eight Go-based microservices, deployed to GKE. The graph displays the container memory usage over a five minute period. For half the time period, the services were at rest. For the second half of the period, the services were under a simulated load, using hey. 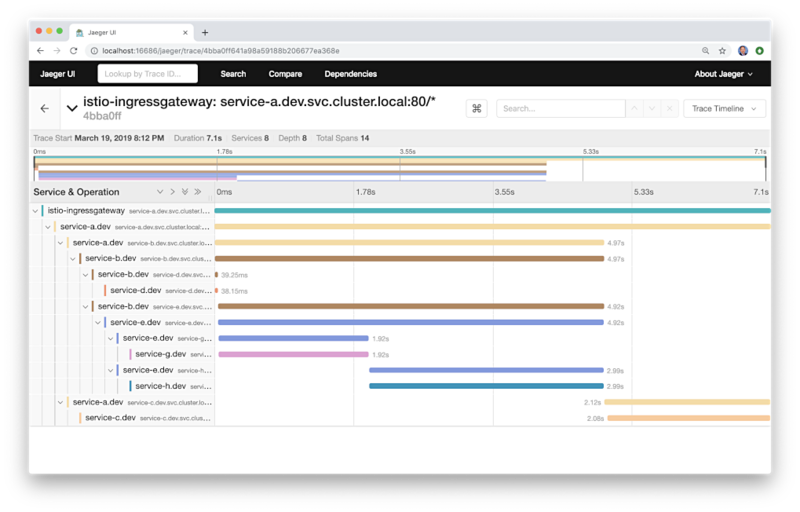 Viewing the memory profile of the services under load can help us determine the container memory minimums and limits, which impact Kubernetes’ scheduling of workloads on the GKE cluster. Metrics such as this might also uncover memory leaks or routing issues, such as the service below, which appears to be consuming 25-50% more memory than its peers. Another example, below, we see a graph representing the total Istio requests to Service A in the dev Namespace, while the system was under load. Compare the graph view above with the same metrics displayed the console view. The multiple entries reflect the multiple instances of Service A in the dev Namespace, over the five-minute period being examined. The values in the individual metric elements indicate the latest metric that was collected. Prometheus also collects basic metrics about Istio components, Kubernetes components, and GKE cluster. Below we can view the total memory of each n1-standard-2 VM nodes in the GKE cluster. According to Istio, the Grafana add-on is a pre-configured instance of Grafana. The Grafana Docker base image has been modified to start with both a Prometheus data source and the Istio Dashboard installed. 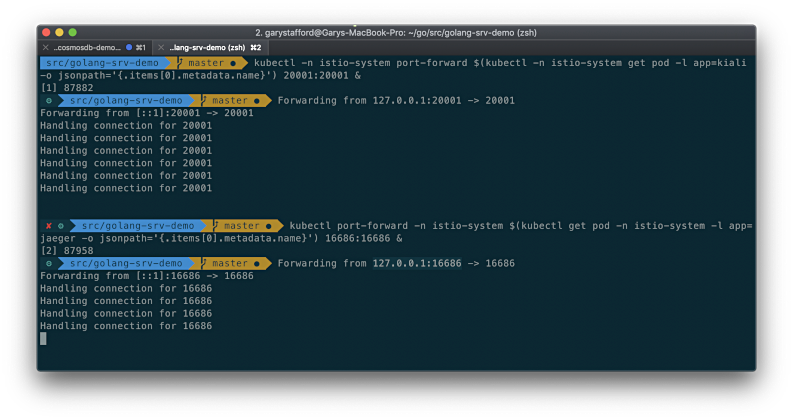 The base install files for Istio, and Mixer in particular, ship with a default configuration of global (used for every service) metrics. The pre-configured Istio Dashboards are built to be used in conjunction with the default Istio metrics configuration and a Prometheus back-end. Below, we see the pre-configured Istio Workload Dashboard. This particular section of the larger dashboard has been filtered to show outbound service metrics in the dev Namespace of our GKE cluster. Similarly, below, we see the pre-configured Istio Service Dashboard. This particular section of the larger dashboard is filtered to show client workloads metrics for the Istio Ingress Gateway in our GKE cluster. Lastly, we see the pre-configured Istio Mesh Dashboard. This dashboard is filtered to show a table view of metrics for components deployed to our GKE cluster. An effective observability strategy must include more than just the ability to visualize results. An effective strategy must also include the ability to detect anomalies and notify (alert) the appropriate resources or take action directly to resolve incidents. Grafana, like Prometheus, is capable of alerting and notification. You visually define alert rules for your critical metrics. Grafana will continuously evaluate metrics against the rules and send notifications when pre-defined thresholds are breached. 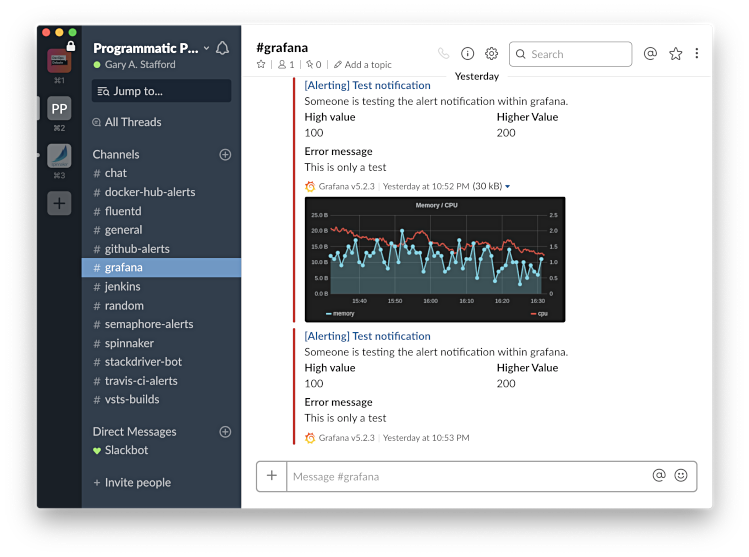 Prometheus supports multiple, popular notification channels, including PagerDuty, HipChat, Email, Kafka, and Slack. Below, we see a new Prometheus notification channel, which sends alert notifications to a Slack support channel. Prometheus is able to send detailed text-based and visual notifications. According to the Open Tracing website, distributed tracing, also called distributed request tracing, is a method used to profile and monitor applications, especially those built using a microservices architecture. Distributed tracing helps pinpoint where failures occur and what causes poor performance. According to Istio, although Istio proxies are able to automatically send spans, applications need to propagate the appropriate HTTP headers, so that when the proxies send span information, the spans can be correlated correctly into a single trace. To accomplish this, an application needs to collect and propagate the following headers from the incoming request to any outgoing requests. The x-b3 headers originated as part of the Zipkin project. The B3 portion of the header is named for the original name of Zipkin, BigBrotherBird. Passing these headers across service calls is known as B3 propagation. According to Zipkin, these attributes are propagated in-process, and eventually downstream (often via HTTP headers), to ensure all activity originating from the same root are collected together. In order to demonstrate distributed tracing with Jaeger, I have modified Service A, Service B, and Service E. These are the three services that make HTTP requests to other upstream services. I have added the following code in order to propagate the headers from one service to the next. 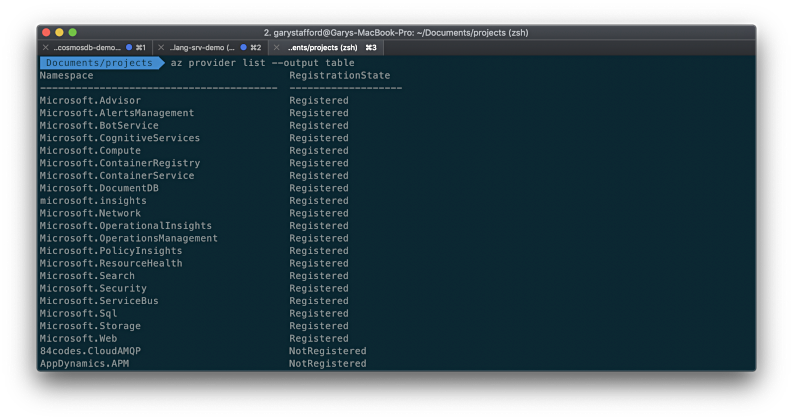 The Istio sidecar proxy (Envoy) generates the first headers. It is critical that you only propagate the headers that are present in the downstream request and have a value, as the code below does. Propagating an empty header will break the distributed tracing. Below, in the highlighted Stackdriver log entry’s JSON payload, we see the required headers, propagated from the root span, which contained a value, being passed from Service A to Service C in the upstream request. Below we see the Jaeger UI Traces View. 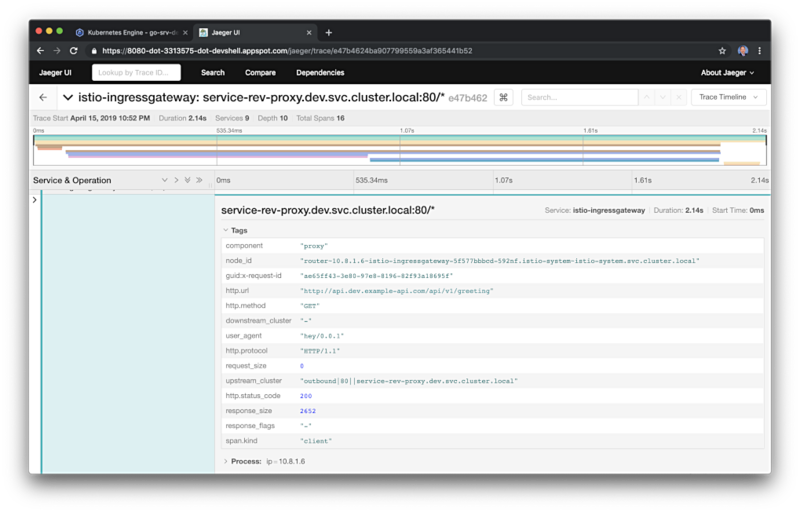 The UI shows the results of a search for the Istio Ingress Gateway service over a period of about forty minutes. We see a timeline of traces across the top with a list of trace results below. As discussed on the Jaeger website, a trace is composed of spans. A span represents a logical unit of work in Jaeger that has an operation name. A trace is an execution path through the system and can be thought of as a directed acyclic graph (DAG) of spans. If you have worked with systems like Apache Spark, you are probably already familiar with DAGs. Below we see the Jaeger UI Trace Detail View. The example trace contains 16 spans, which encompasses eight services – seven of the eight Go-based services and the Istio Ingress Gateway. The trace and the spans each have timings. The root span in the trace is the Istio Ingress Gateway. 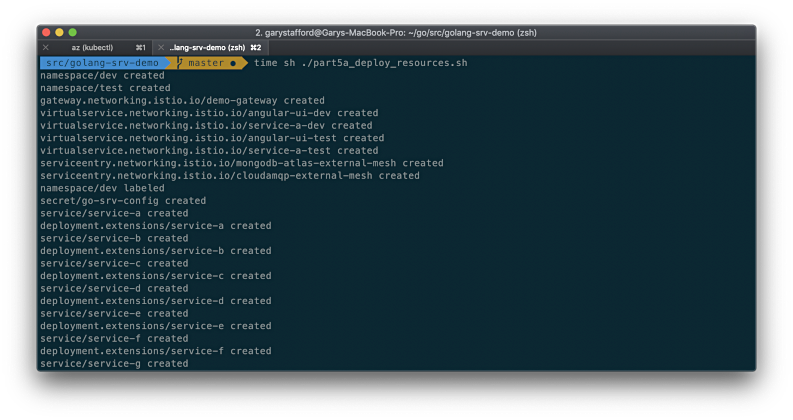 The Angular UI, loaded in the end user’s web browser, calls the mesh’s edge service, Service A, through the Istio Ingress Gateway. From there, we see the expected flow of our service-to-service IPC. Service A calls Services B and C. Service B calls Service E, which calls Service G and Service H. In this demo, traces do not span the RabbitMQ message queues. This means you would not see a trace which includes a call from Service D to Service F, via the RabbitMQ. The latest version of Jaeger also includes a Compare feature and two Dependencies views, Force-Directed Graph, and DAG. I find both views rather primitive compared to Kiali, and more similar to Service Graph. Lacking access to Kiali, the views are marginally useful as a dependency graph. 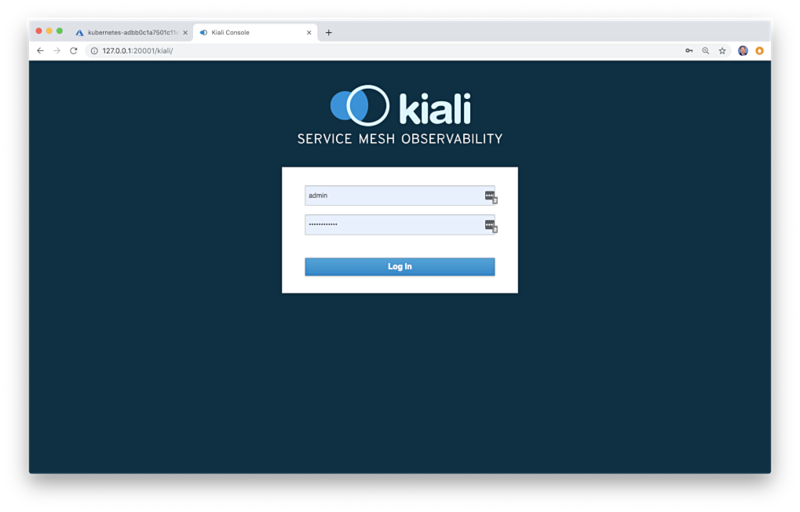 According to their website, Kiali provides answers to the questions: What are the microservices in my Istio service mesh, and how are they connected? There is a common Kubernetes Secret that controls access to the Kiali API and UI. The default login is admin, the password is 1f2d1e2e67df. 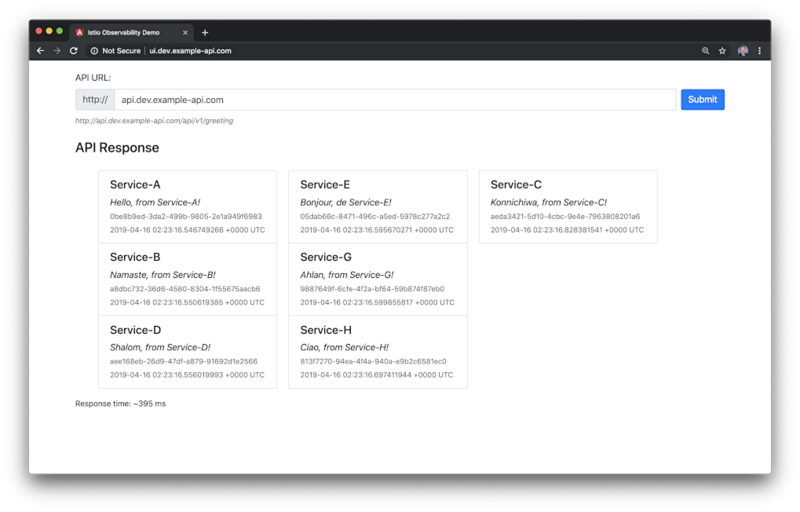 Logging into Kiali, we see the Overview menu entry, which provides a global view of all namespaces within the Istio service mesh and the number of applications within each namespace. The Graph View in the Kiali UI is a visual representation of the components running in the Istio service mesh. 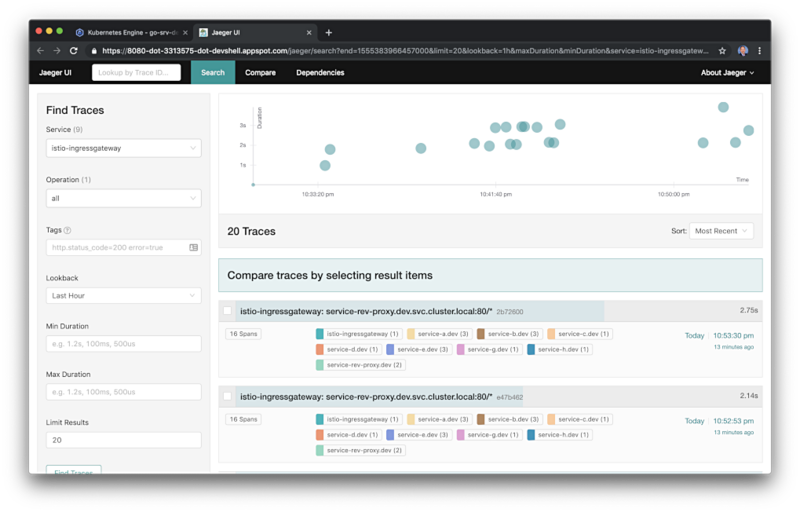 Below, filtering on the cluster’s dev Namespace, we can observe that Kiali has mapped 8 applications (workloads), 10 services, and 24 edges (a graph term). Specifically, we see the Istio Ingres Proxy at the edge of the service mesh, the Angular UI, the eight Go-based microservices and their Envoy proxy sidecars that are taking traffic (Service F did not take any direct traffic from another service in this example), the external MongoDB Atlas cluster, and the external CloudAMQP cluster. Note how service-to-service traffic flows, with Istio, from the service to its sidecar proxy, to the other service’s sidecar proxy, and finally to the service. Below, we see a similar view of the service mesh, but this time, there are failures between the Istio Ingress Gateway and the Service A, shown in red. We can also observe overall metrics for the HTTP traffic, such as total requests/minute, errors, and status codes. Kiali can also display average requests times and other metrics for each edge in the graph (the communication between two components). Kiali can also show application versions deployed, as shown below, the microservices are a combination of versions 1.3 and 1.4. Focusing on the external MongoDB Atlas cluster, Kiali also allows us to view TCP traffic between the four services within the service mesh and the external cluster. The Applications menu entry lists all the applications and their error rates, which can be filtered by Namespace and time interval. Here we see that the Angular UI was producing errors at the rate of 16.67%. 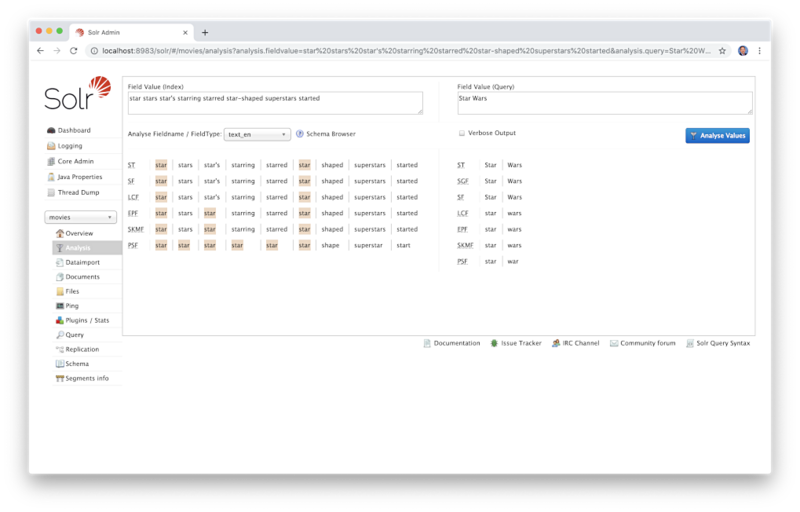 On both the Applications and Workloads menu entry, we can drill into a component to view additional details, including the overall health, number of Pods, Services, and Destination Services. Below, we see details for Service B in the dev Namespace. 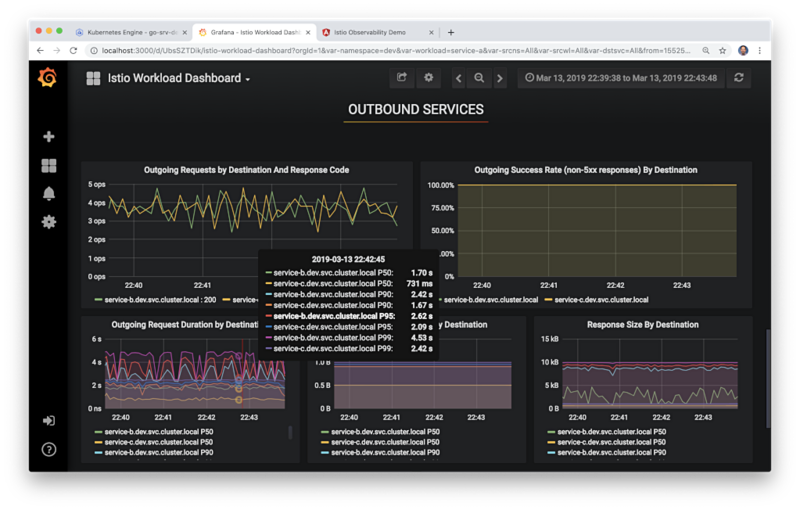 The Workloads detailed view also includes inbound and outbound metrics. Below, the outbound volume, duration, and size metrics, for Service A in the dev Namespace. Finally, Kiali presents an Istio Config menu entry. The Istio Config menu entry displays a list of all of the available Istio configuration objects that exist in the user’s environment. Oftentimes, I find Kiali to be my first stop when troubleshooting platform issues. 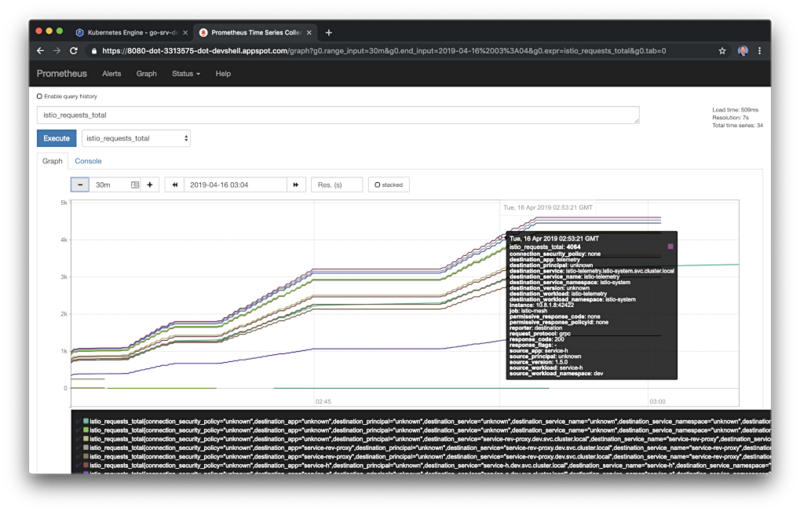 Once I identify the specific components or communication paths having issues, I can search the Stackdriver logs and the Prometheus metrics, through the Grafana dashboard. In this two-part post, we have explored the current set of observability tools, which are part of the latest version of Istio Service Mesh. 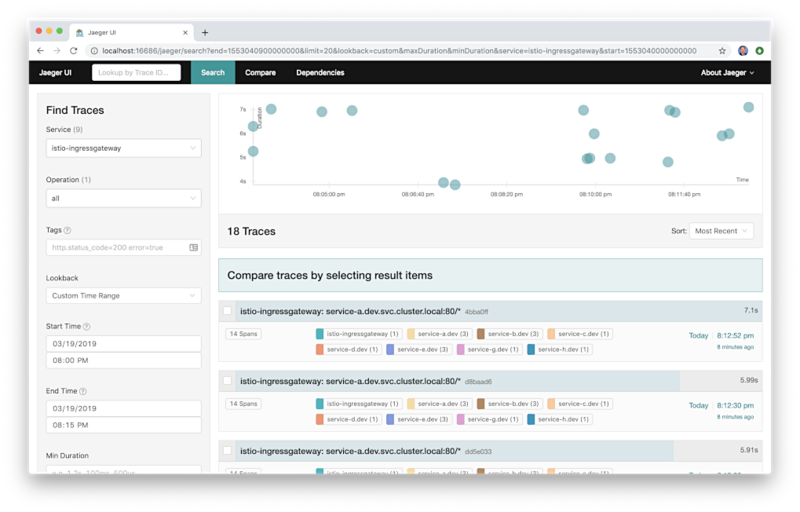 These tools included Prometheus and Grafana for metric collection, monitoring, and alerting, Jaeger for distributed tracing, and Kiali for Istio service-mesh-based microservice visualization. 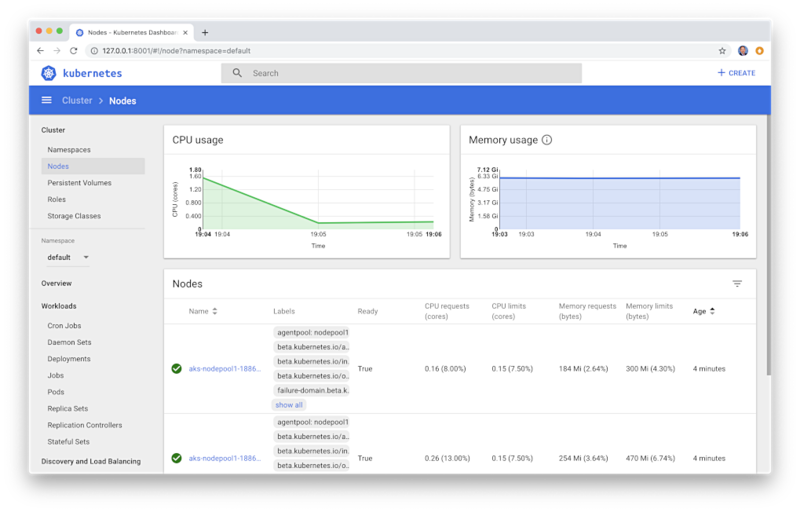 Combined with cloud platform-native monitoring and logging services, such as Stackdriver for Google Kubernetes Engine (GKE) on Google Cloud Platform (GCP), we have a complete observability solution for modern, distributed applications. In this two-part post, we will explore the set of observability tools which are part of the Istio Service Mesh. These tools include Jaeger, Kiali, Prometheus, and Grafana. To assist in our exploration, we will deploy a Go-based, microservices reference platform to Google Kubernetes Engine, on the Google Cloud Platform. Similar to blockchain, serverless, AI and ML, chatbots, cybersecurity, and service meshes, Observability is a hot buzz word in the IT industry right now. According to Wikipedia, observability is a measure of how well internal states of a system can be inferred from knowledge of its external outputs. Logs, metrics, and traces are often known as the three pillars of observability. These are the external outputs of the system, which we may observe. The O’Reilly book, Distributed Systems Observability, by Cindy Sridharan, does an excellent job of detailing ‘The Three Pillars of Observability’, in Chapter 4. I recommend reading this free online excerpt, before continuing. A second great resource for information on observability is honeycomb.io, a developer of observability tools for production systems, led by well-known industry thought-leader, Charity Majors. The honeycomb.io site includes articles, blog posts, whitepapers, and podcasts on observability. As modern distributed systems grow ever more complex, the ability to observe those systems demands equally modern tooling that was designed with this level of complexity in mind. Traditional logging and monitoring systems often struggle with today’s hybrid and multi-cloud, polyglot language-based, event-driven, container-based and serverless, infinitely-scalable, ephemeral-compute platforms. 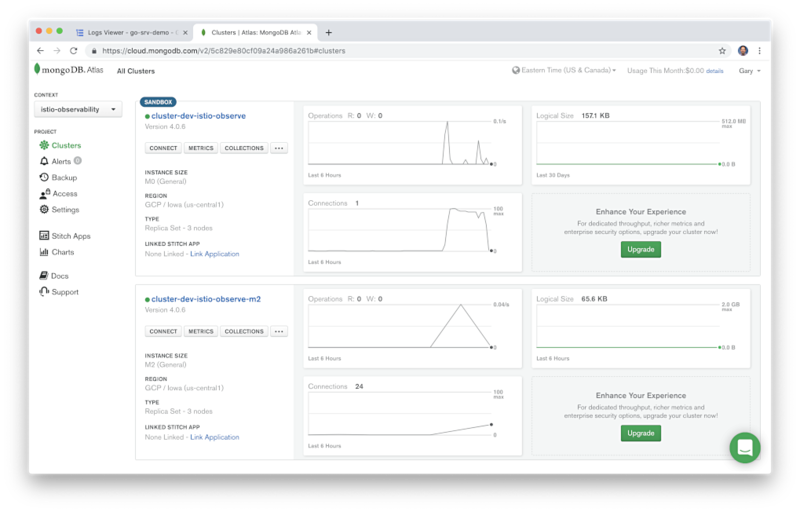 Tools like Istio Service Mesh attempt to solve the observability challenge by offering native integrations with several best-of-breed, open-source telemetry tools. Istio’s integrations include Jaeger for distributed tracing, Kiali for Istio service mesh-based microservice visualization, and Prometheus and Grafana for metric collection, monitoring, and alerting. Combined with cloud platform-native monitoring and logging services, such as Stackdriver for Google Kubernetes Engine (GKE) on Google Cloud Platform (GCP), we have a complete observability platform for modern, distributed applications. 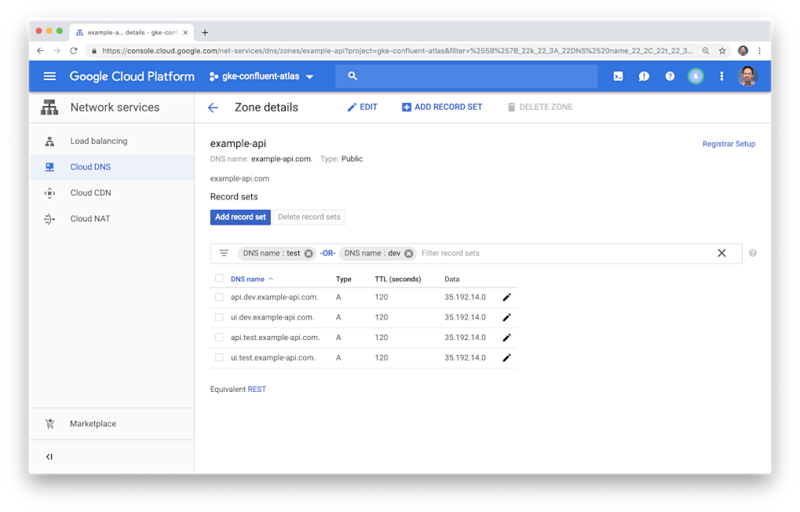 To demonstrate the observability tools integrated with the latest version of Istio Service Mesh, we will deploy a reference microservices platform, written in Go, to GKE on GCP. I developed the reference platform to demonstrate concepts such as API management, Service Meshes, Observability, DevOps, and Chaos Engineering. The platform is comprised of (14) components, including (8) Go-based microservices, labeled generically as Service A – Service H, (1) Angular 7, TypeScript-based front-end, (4) MongoDB databases, and (1) RabbitMQ queue for event queue-based communications. The platform and all its source code is free and open source. The reference platform is designed to generate HTTP-based service-to-service, TCP-based service-to-database (MongoDB), and TCP-based service-to-queue-to-service (RabbitMQ) IPC (inter-process communication). Service A calls Service B and Service C, Service B calls Service D and Service E, Service D produces a message on a RabbitMQ queue that Service F consumes and writes to MongoDB, and so on. These distributed communications can be observed using Istio’s observability tools when the system is deployed to a Kubernetes cluster running the Istio service mesh. On the reference platform, each upstream service responds to requests from downstream services by returning a small informational JSON payload (termed a greeting in the source code). The responses are aggregated across the service call chain, resulting in an array of service responses being returned to the edge service and on to the Angular-based UI, running in the end user’s web browser. The response aggregation feature is simply used to confirm that the service-to-service communications, Istio components, and the telemetry tools are working properly. Each Go microservice contains a /ping and /health endpoint. The /health endpoint can be used to configure Kubernetes Liveness and Readiness Probes. Additionally, the edge service, Service A, is configured for Cross-Origin Resource Sharing (CORS) using the access-control-allow-origin: * response header. CORS allows the Angular UI, running in end user’s web browser, to call the Service A /ping endpoint, which resides in a different subdomain from UI. Shown below is the Go source code for Service A. For this demonstration, the MongoDB databases will be hosted, external to the services on GCP, on MongoDB Atlas, a MongoDB-as-a-Service, cloud-based platform. Similarly, the RabbitMQ queues will be hosted on CloudAMQP, a RabbitMQ-as-a-Service, cloud-based platform. I have used both of these SaaS providers in several previous posts. Using external services will help us understand how Istio and its observability tools collect telemetry for communications between the Kubernetes cluster and external systems. Shown below is the Go source code for Service F, This service consumers messages from the RabbitMQ queue, placed there by Service D, and writes the messages to MongoDB. All source code for this post is available on GitHub in two projects. The Go-based microservices source code, all Kubernetes resources, and all deployment scripts are located in the k8s-istio-observe-backend project repository. The Angular UI TypeScript-based source code is located in the k8s-istio-observe-frontend project repository. You should not need to clone the Angular UI project for this demonstration. Docker images referenced in the Kubernetes Deployment resource files, for the Go services and UI, are all available on Docker Hub. The Go microservice Docker images were built using the official Golang Alpine base image on DockerHub, containing Go version 1.12.0. Using the Alpine image to compile the Go source code ensures the containers will be as small as possible and contain a minimal attack surface. 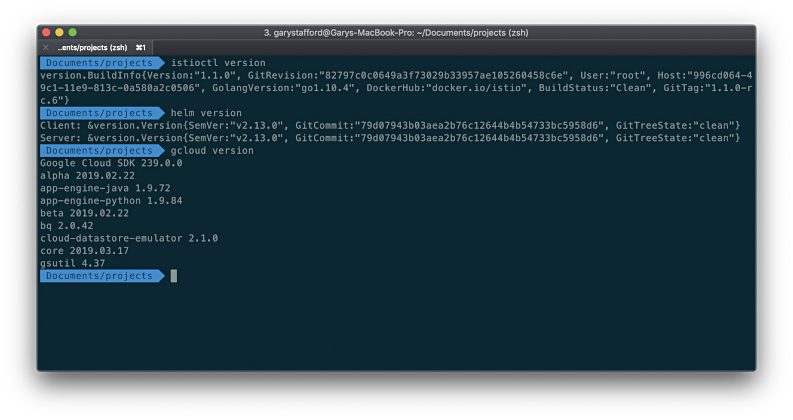 To follow along with the post, you will need the latest version of gcloud CLI (min. ver. 239.0.0), part of the Google Cloud SDK, Helm, and the just releases Istio 1.1.0, installed and configured locally or on your build machine. To deploy the microservices platform to GKE, we will proceed in the following order. Observe the results in part two! MongoDB Atlas is a fully-managed MongoDB-as-a-Service, available on AWS, Azure, and GCP. Atlas, a mature SaaS product, offers high-availability, guaranteed uptime SLAs, elastic scalability, cross-region replication, enterprise-grade security, LDAP integration, a BI Connector, and much more. MongoDB Atlas currently offers four pricing plans, Free, Basic, Pro, and Enterprise. Plans range from the smallest, M0-sized MongoDB cluster, with shared RAM and 512 MB storage, up to the massive M400 MongoDB cluster, with 488 GB of RAM and 3 TB of storage. For this post, I have created an M2-sized MongoDB cluster in GCP’s us-central1 (Iowa) region, with a single user database account for this demo. The account will be used to connect from four of the eight microservices, running on GKE. Originally, I started with an M0-sized cluster, but the compute resources were insufficient to support the volume of calls from the Go-based microservices. I suggest at least an M2-sized cluster or larger. CloudAMQP provides full-managed RabbitMQ clusters on all major cloud and application platforms. RabbitMQ will support a decoupled, eventually consistent, message-based architecture for a portion of our Go-based microservices. For this post, I have created a RabbitMQ cluster in GCP’s us-central1 (Iowa) region, the same as our GKE cluster and MongoDB Atlas cluster. I chose a minimally-configured free version of RabbitMQ. CloudAMQP also offers robust, multi-node RabbitMQ clusters for Production use. There are a few configuration settings you will need to change in the GitHub project’s Kubernetes resource files and Bash deployment scripts. 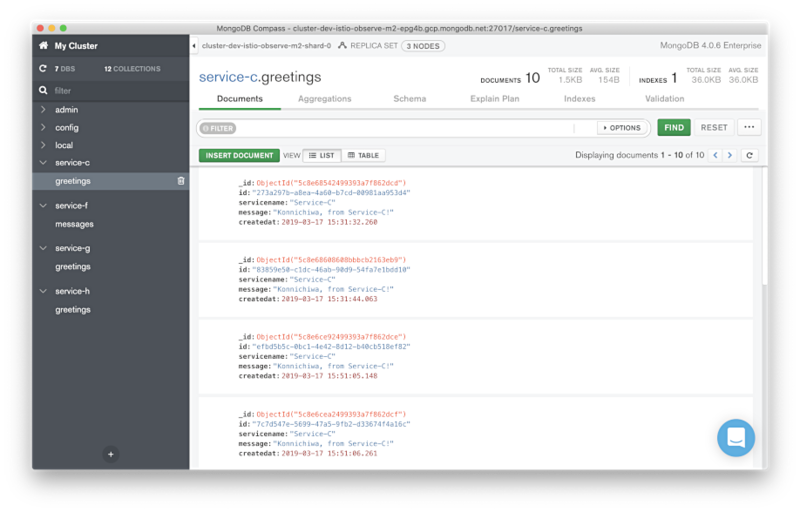 Modify the Istio ServiceEntry, external-mesh-mongodb-atlas.yaml file, adding you MongoDB Atlas host address. This file allows egress traffic from four of the microservices on GKE to the external MongoDB Atlas cluster. Modify the Istio ServiceEntry, external-mesh-cloudamqp.yaml file, adding you CloudAMQP host address. This file allows egress traffic from two of the microservices to the CloudAMQP cluster. There are numerous strategies you may use to route traffic into the GKE cluster, via Istio. I am using a single domain for the post, example-api.com, and four subdomains. One set of subdomains is for the Angular UI, in the dev Namespace (ui.dev.example-api.com) and the test Namespace (ui.test.example-api.com). The other set of subdomains is for the edge API microservice, Service A, which the UI calls (api.dev.example-api.com and api.test.example-api.com). Traffic is routed to specific Kubernetes Service resources, based on the URL. According to Istio, the Gateway describes a load balancer operating at the edge of the mesh, receiving incoming or outgoing HTTP/TCP connections. Modify the Istio ingress Gateway, inserting your own domains or subdomains in the hosts section. These are the hosts on port 80 that will be allowed into the mesh. According to Istio, a VirtualService defines a set of traffic routing rules to apply when a host is addressed. A VirtualService is bound to a Gateway to control the forwarding of traffic arriving at a particular host and port. Modify the project’s four Istio VirtualServices, inserting your own domains or subdomains. Here is an example of one of the four VirtualServices, in the istio-gateway.yaml file. 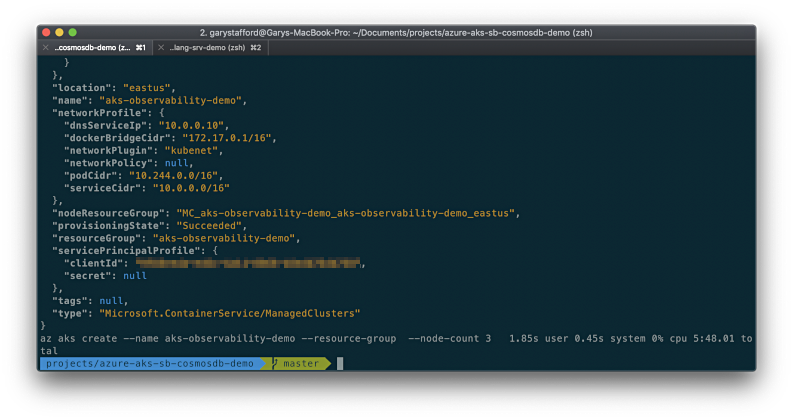 The project contains a Kubernetes Secret, go-srv-demo.yaml, with two values. One is for the MongoDB Atlas connection string and one is for the CloudAMQP connections string. Remember Kubernetes Secret values need to be base64 encoded. On Linux and Mac, you can use the base64 program to encode the connection strings. The bash script, part3_create_gke_cluster.sh, contains a series of environment variables. At a minimum, you will need to change the PROJECT variable in all scripts to match your GCP project name. # Constants - CHANGE ME! The bash script, part4_install_istio.sh, includes the ISTIO_HOME variable. The value should correspond to your local path to Istio 1.1.0. On my local Mac, this value is shown below. Next, deploy the GKE cluster using the included bash script, part3_create_gke_cluster.sh. This will create a Regional, multi-zone, 3-node GKE cluster, using the latest version of GKE at the time of this post, 1.12.5-gke.5. The cluster will be deployed to the same region as the MongoDB Atlas and CloudAMQP clusters, GCP’s us-central1 (Iowa) region. Planning where your Cloud resources will reside, for both SaaS providers and primary Cloud providers can be critical to minimizing latency for network I/O intensive applications. With the GKE cluster and associated infrastructure in place, deploy Istio. For this post, I have chosen to install Istio using Helm, as recommended my Istio. 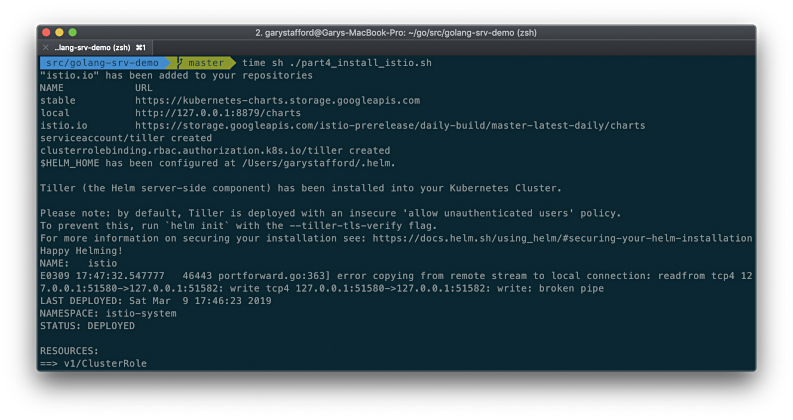 To deploy Istio using Helm, use the included bash script, part4_install_istio.sh. 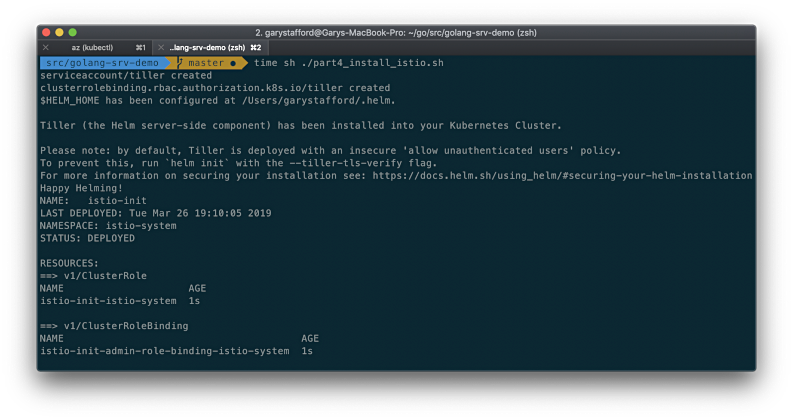 The script installs Istio, using the Helm Chart in the local Istio 1.1.0 install/kubernetes/helm/istio directory, which you installed as a requirement for this demonstration. The Istio install script overrides several default values in the Istio Helm Chart using the --set, flag. The list of available configuration values is detailed in the Istio Chart’s GitHub project. The options enable Istio’s observability features, which we will explore in part two. Features include Kiali, Grafana, Prometheus, and Jaeger. Below, we see the Istio-related Workloads running on the cluster, including the observability tools. Below, we see the corresponding Istio-related Service resources running on the cluster. Instead of using IP addresses to route traffic the GKE cluster and its applications, we will use DNS. As explained earlier, I have chosen a single domain for the post, example-api.com, and four subdomains. One set of subdomains is for the Angular UI, in the dev Namespace and the test Namespace. The other set of subdomains is for the edge microservice, Service A, which the API calls. Traffic is routed to specific Kubernetes Service resources, based on the URL. Deploying the GKE cluster and Istio triggers the creation of a Google Load Balancer, four IP addresses, and all required firewall rules. One of the four IP addresses, the one shown below, associated with the Forwarding rule, will be associated with the front-end of the load balancer. Below, we see the new load balancer, with the front-end IP address and the backend VM pool of three GKE cluster’s worker nodes. Each node is assigned one of the IP addresses, as shown above. As shown below, using Google Cloud DNS, I have created the four subdomains and assigned the IP address of the load balancer’s front-end to all four subdomains. Ingress traffic to these addresses will be routed through the Istio ingress Gateway and the four Istio VirtualServices, to the appropriate Kubernetes Service resources. Use your choice of DNS management tools to create the four A Type DNS records. Next, deploy the eight Go-based microservices, the Angular UI, and the associated Kubernetes and Istio resources to the GKE cluster. 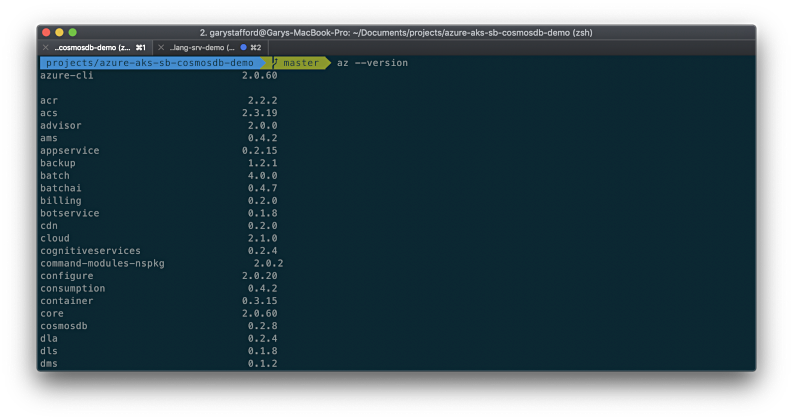 To deploy the platform, use the included bash deploy script, part5a_deploy_resources.sh. If anything fails and you want to remove the existing resources and re-deploy, without destroying the GKE cluster or Istio, you can use the part5b_delete_resources.sh delete script. The deploy script deploys all the resources two Kubernetes Namespaces, dev and test. 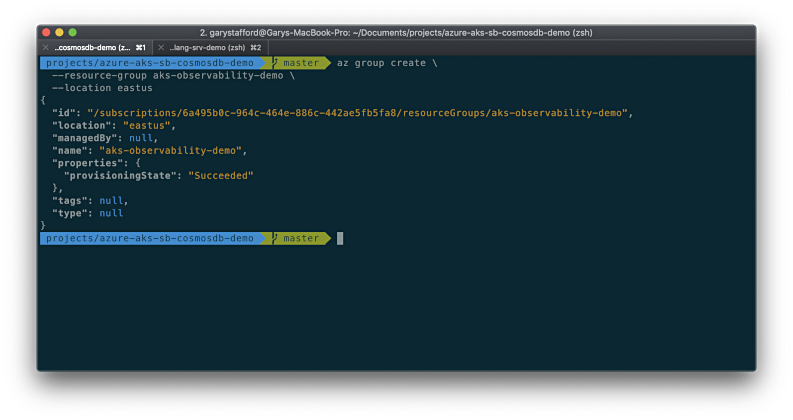 This will allow us to see how we can differentiate between Namespaces when using the observability tools. Below, we see the Istio-related resources, which we just deployed. They include the Istio Gateway, four Istio VirtualService, and two Istio ServiceEntry resources. Below, we see the platform’s Workloads (Kubernetes Deployment resources), running on the cluster. 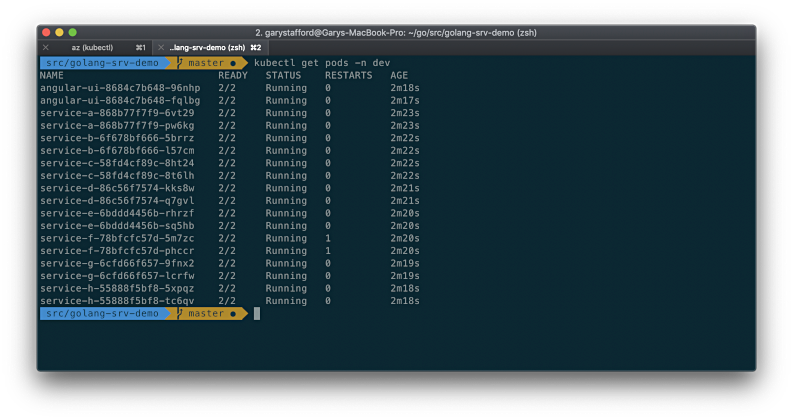 Here we see two Pods for each Workload, a total of 18 Pods, running in the dev Namespace. Each Pod contains both the deployed microservice or UI component, as well as a copy of Istio’s Envoy Proxy. Below, we see the corresponding Kubernetes Service resources running in the dev Namespace. 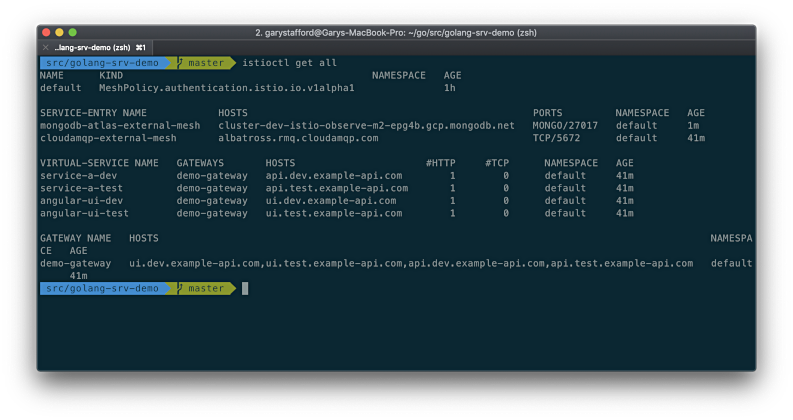 Below, a similar view of the Deployment resources running in the test Namespace. Again, we have two Pods for each deployment with each Pod contains both the deployed microservice or UI component, as well as a copy of Istio’s Envoy Proxy. We do want to ensure the platform’s eight Go-based microservices and Angular UI are working properly, communicating with each other, and communicating with the external MongoDB Atlas and CloudAMQP RabbitMQ clusters. The easiest way to test the cluster is by viewing the Angular UI in a web browser. You can also use performance testing tools to load-test the platform. Many issues will not show up until the platform is under load. I recently starting using hey, a modern load generator tool, as a replacement for Apache Bench (ab), Unlike ab, hey supports HTTP/2 endpoints, which is required to test the platform on GKE with Istio. 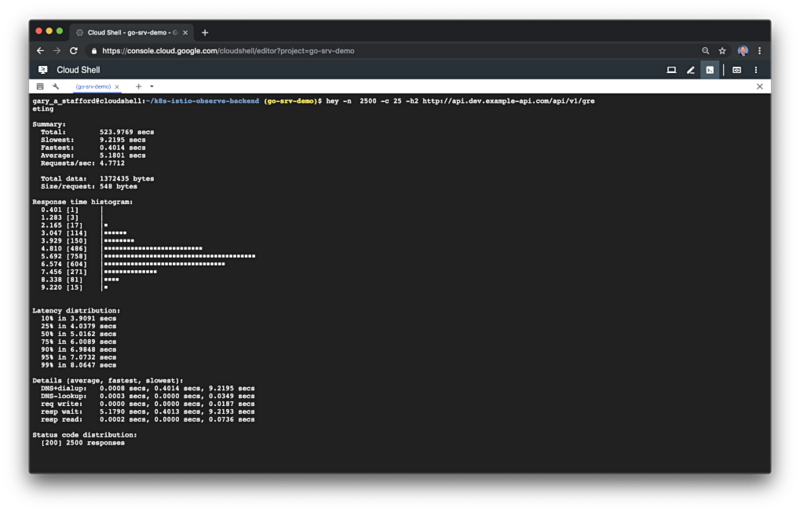 Below, I am running hey directly from Google Cloud Shell. The tool is simulating 25 concurrent users, generating a total of 1,000 HTTP/2-based GET requests to Service A.
I suggest starting the troubleshooting by calling Service A, the API’s edge service, directly, using cURL or Postman. You should see a JSON response payload, similar to the following. This suggests the issue is with the UI, not the API. Next, confirm that the four MongoDB databases were created for Service D, Service, F, Service, G, and Service H. Also, confirm that new documents are being written to the database’s collections. Next, confirm new the RabbitMQ queue was created, using the CloudAMQP RabbitMQ Management Console. Service D produces messages, which Service F consumes from the queue. Lastly, review the Stackdriver logs to see if there are any obvious errors. In part two of this post, we will explore each observability tool, and see how they can help us manage our GKE cluster and the reference platform running in the cluster. Since the cluster only takes minutes to fully create and deploy resources to, if you want to tear down the GKE cluster, run the part6_tear_down.sh script. In this post, we will examine what sets Apache Solr aside as a search engine, from conventional databases like MongoDB. We will explore the similarities and differences between Solr and MongoDB by analyzing a series of comparative queries. We will then delve into some of Solr’s more advanced search capabilities. The ability to search for information is a basic requirement of many applications. Architects and Developers who limit themselves to traditional databases, often attempt to meet search requirements by creating unnecessarily and overly complex SQL query-based solutions. They force end-users to search in unnatural or highly-structured ways or provide results that lack a sense of relevancy. End-users are not Database Administrators, they do not understand the nuances of SQL, they simply want relevant responses to their inquiries. In a scenario where data consumers are arbitrarily searching for relevant information within a distinct domain, implementing a search-optimized, Lucene-based platform, such as Elasticsearch or Apache Solr, for reads, is often an effective solution. Separating database reads from writes is not uncommon. I’ve worked on many projects where the requirements suggested an architecture in which one type of data storage technology should be implemented to optimize for writes, while a different type or types of data storage technologies should be implemented to optimize for reads. Architectures in which this is common include the following. In this post, we will examine the search capabilities of Apache Solr. We will compare and contrast Solr’s search capabilities to those of MongoDB, the leading NoSQL database. We will consider the differences between querying for data and searching for information. According to Apache, the Apache Lucene project develops open-source search software, including the following sub-projects: Lucene Core, Solr, and PyLucene. The Lucene Core sub-project provides Java-based indexing and search technology, as well as spellchecking, hit highlighting, and advanced analysis/tokenization capabilities. Apache Lucene 7.7.0 and Apache Solr 7.7.0 were just released in February 2019 and used for all the post’s examples. According to Apache, Apache Solr is the popular, blazing fast, open source, enterprise search platform built on Apache Lucene. Solr powers the search and navigation features of many of the world’s largest internet sites. Apache Solr includes the ability to set up a cluster of Solr servers that combines fault tolerance and high availability. Referred to as SolrCloud, and backed by Apache Zookeeper, these capabilities provide distributed, sharded, and replicated indexing and search capabilities. According to Wikipedia, Solr was created at CNET Networks in 2004, donated to the Apache Software Foundation in 2006, and graduated from their incubator in 2007. Solr version 1.3 was released in 2008. In 2010, the Lucene and Solr projects merged; Solr became a Lucene subproject. With Apache Solr 7.7.0 just released, Solr has well over ten years of development and enterprise adoption behind it. The leading NoSQL database, MongoDB, describes itself as a document database with the scalability and flexibility that you want with the querying and indexing that users need. 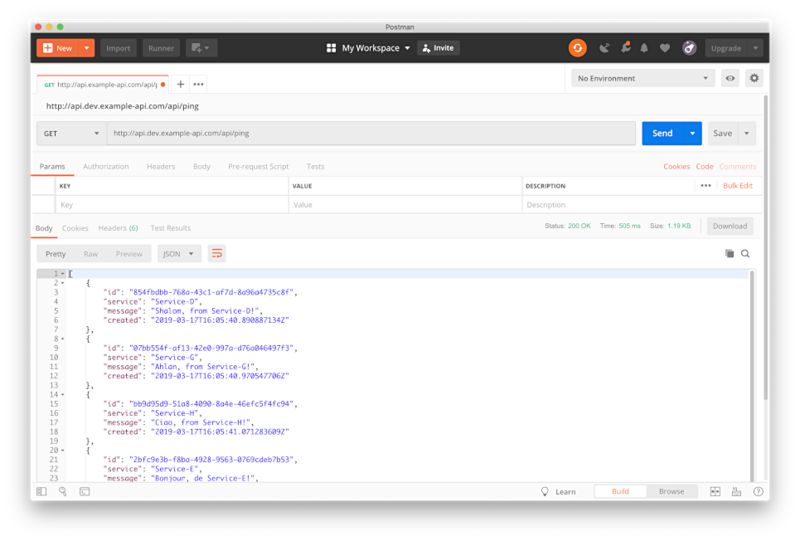 Mongo features include ad hoc queries, indexing, and real-time aggregation, which provide powerful ways to access and analyze your data. Released less than a year ago, MongoDB 4.0 added multi-document ACID transactions, data type conversions, non-blocking secondary replica reads, SHA-2 authentication, MongoDB Compass aggregation pipeline builder, Kubernetes integration, and the MongoDB Stitch serverless platform. MongoDB 4.0.6 was just released in February 2019 and used for all the post’s examples. Solr and MongoDB appear to have many search-related features in common. All examples shown in this post are available as a series of Python 3 scripts, contained in an open-source project on GitHub, searching-solr-vs-mongodb. The project contains the script, query_mongo.py, which uses the Python driver for MongoDB, pymongo, to execute all the MongoDB queries in this post. The project also contains the script, query_solr.py, which uses the lightweight Python wrapper for Apache Solr, pysolr, to execute all the Solr searches in this post. Both packages, along with ancillary packages, may be installed with pip. To follow along, you will need your own MongoDB and Solr instances. 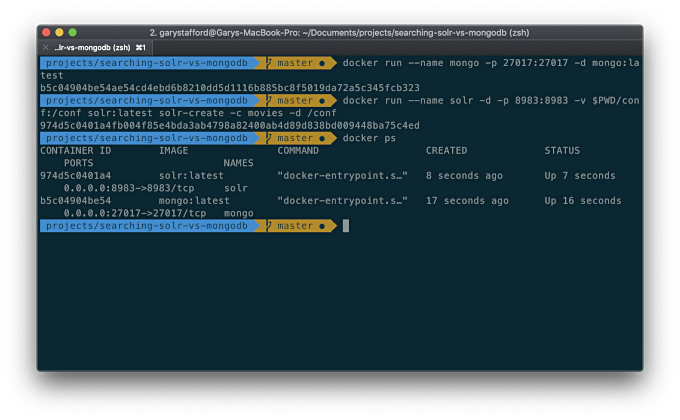 Both are easily stood up locally with Docker, using the official MongoDB and Solr Docker Hub images. Example docker run commands are shown below. The second command, the Solr command, also creates a new Solr core. 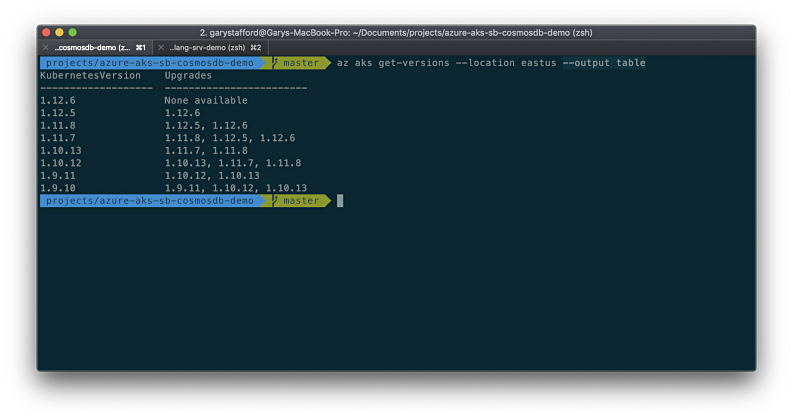 The command also bind-mounts the ‘conf’ directory, within the local project, into the container. This will give us the ability to modify our index’s configuration and to store that configuration in source control. All data is ephemeral, neither container persists data outside the container, using these particular commands. The source code expects two environment variables, which contain the connection information for MongoDB and Solr. You will need to replace the values below with your own connection strings if they are different than the examples below, used for Docker. 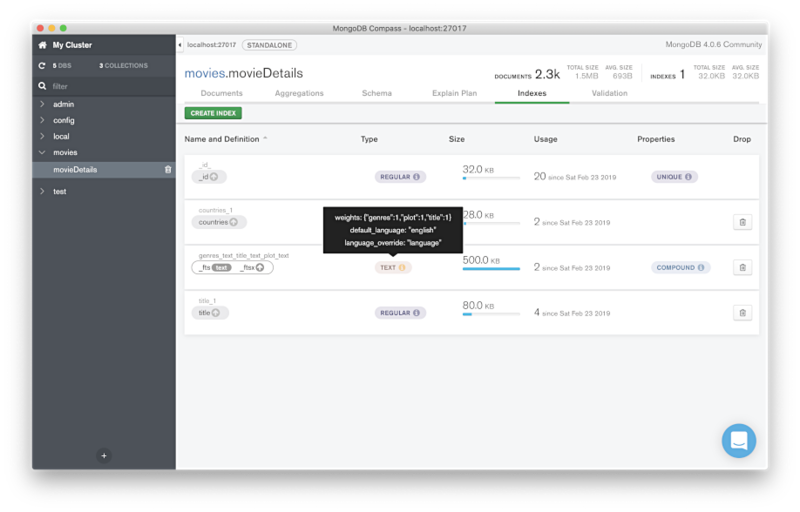 For this post, we will be using a publicly available movie dataset from MongoDB. A copy of the dataset is available in the project, as well as on MongoDB’s website, Setup and Import the Data. 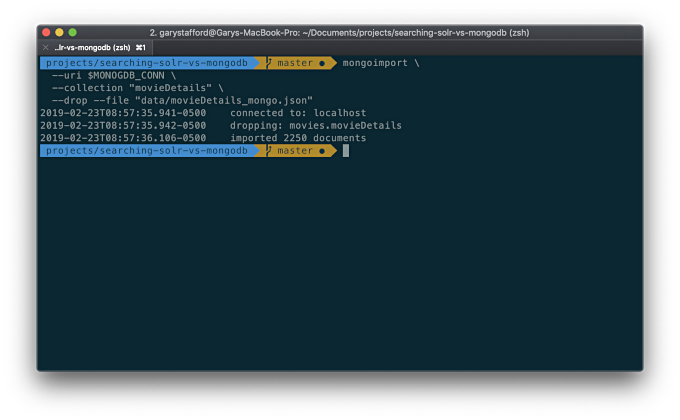 Assuming you have an instance of MongoDB accessible and have set the two environment variables above, import the specially-formatted JSON file for MongoDB, movieDetails_mongo.json, directly into the movies database’s movieDetails collection, using the following mongoimport command. Below is a view of the movies database’s movieDetails collection, running in the Docker container, as shown in the MongoDB Compass application. Assuming you have an instance of Solr accessible and have set the two environment variables above, import the contents of the JSON file, movieDetails.json, by running the Python script, solr_index_movies.py, using the following command. The command executes a series of HTTP calls to Solr’s exposed RESTful API. Below is a view of the Solr Administration User Interface, running within the Docker container, and showing the new movies core. After running the script, we should have 2,250 movie documents indexed. The Solr Admin UI offers a number of useful tools for examing indexes, reviewing schemas and field types, and creating, analyzing, and debugging Solr queries. Below we see the Query UI with the results of a query displayed. The movies index uses a default schema, which was created when the movie documents were indexed. To optimize our query results, we will want to make a few adjustments to the default movies schema. First, we want to ensure that our Solr searches consider the pluralization of words. For example, when we search for the search term ‘Adventure’, we want Solr to also return documents containing terms like adventure, adventures, adventure’s, adventuring, and adventurer, but not misadventure. This is known as Stemming, or reducing words to their word stem. An example is shown below in the Solr Analysis UI. The fields that we want to search, such as title, plot, and genres, were all indexed by default as the ‘text_general’ Solr field type. The ‘text_general’ field type does not implement stemming when indexing or querying. We need to switch the title, plot, and genres fields to the ‘text_en’ (English text) field type. The ‘text_en’ field type implements multiple indexing and querying filters, including the PorterStemFilterFactory filter, which removes common endings from words. Similar filters include the English Minimal Stem Filter and the English Possessive Filter. Additionally, the MultiValued field property is set to true by default for these fields in Solr. Since the title and plot fields, amongst others, were only intended to hold a single text value, as opposed to an array of values, we will switch the MultiValued field property to false. This helps with sorting and filtering, and the correct deserialization of documents. The solr_index_movies.py script will change the title, plot, and genres fields from text_general’ to ‘text_en’ and change the title and plot fields from multi-valued to single-valued. Since we have changed the index’s schema, the script will re-import all the documents after making the schema changes. To get a better sense of what the schema changes look like, let’s look at the equivalent cURL command to change the schema. This gives you a better sense of the field-level modifications we are making. You can use the Schema UI to view the results, as shown below. Note the new field types for title, plot, and genres. Also, note the index and query analyzers, including the PorterStemFilterFactory, used by the ‘text_en’ field type. To demonstrate the similarities and the differences between Solr and MongoDB, we will examine a series of comparative queries, followed by a series of Solr-only searches. Again, all queries and output shown are included in the two project’s Python scripts. To start, we will perform a simple query for all the movie documents in the MongoDB collection, followed by the Solr index. With MongoDB, we use the find method. With Solr, we will use the Standard Query Parser, commonly known as the ‘lucene’ query parser, and the q (query) parameter. The result of the queries should be identical, with all 2,250 documents returned. We can alter our first query to limit our response to only the count of documents for a given query in MongoDB; no documents will be returned. Since our query is empty, we will get back a count of all documents in the MongoDB database’s collection. Similarly, in Solr, we can set the rows parameter to zero to return only the document count. For brevity, we can also omit the Solr response header using the omitHeader parameter. Next, we will perform a query for the exact movie title, ‘Star Wars: Episode V – The Empire Strikes Back’ in MongoDB, then Solr. Again, the results of the queries should be identical, with one document returned, matching the title. The quotes around the title are key for Solr to view the query as a single phrase as opposed to a series of search terms. q: title:"Star Wars: Episode V - The Empire Strikes Back"
Note the use of 'defType': 'lucene' is optional. The standard Lucene query parser is the default parser used by Solr. I am merely showing this parameter to improve the reader’s understanding. Later, we will use other query parsers. Next, we will perform a query for the phrase ‘star wars’. With MongoDB, we will use the $regex and $options Evaluation Query Operators. The results from both the MongoDB and Solr queries should be identical, the six Star Wars movies are returned. 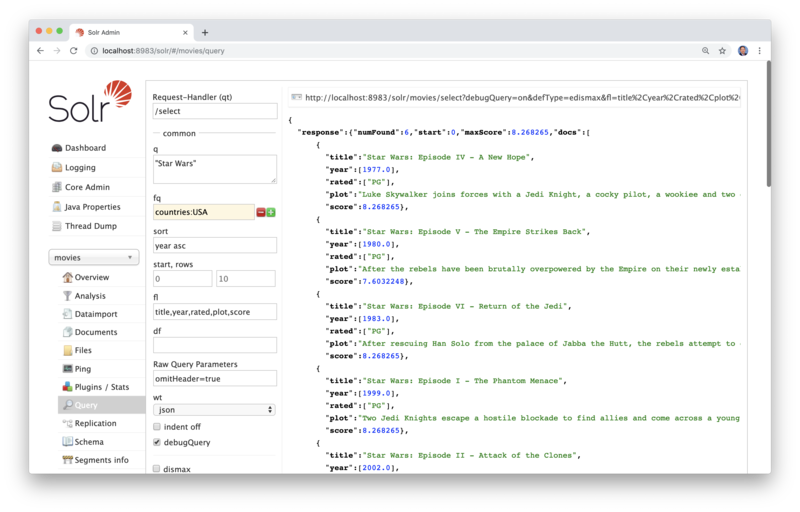 With Solr, wrapping the phrase ‘star wars’ in quotes ensures Solr will treat the query string as an exact phrase, not individual search terms. Solr results are scored, but scores are almost all identical since all six movies contain the exact phrase. Here is the actual Lucene query (q) Solr will run. Next, we will perform a query for all movies whose title contains either the search terms ‘star’ or ‘wars’, as opposed to the phrase, ‘star wars’. The Solr web console has a very powerful Analysis tool. Using the Analysis tool, we can examine how each filter (abbreviated in the far left column, below), associated with a particular field type, will impact the matching capabilities of Solr. To use the Analysis tool, place your search term(s) or phrase on the right side, an indexed field value on the left, and choose a field or field type from the dropdown. Below, we see how the search terms ‘Star’ and ‘Wars’ (shown below right) would match a series of variations on the two words (shown below left) if the fields being searched are of the field type, ‘text_en’, as discussed earlier. For example, a query for ‘Star’ would match ‘star’, ‘stars’, ‘star‘s’, ‘starring’, ‘starred’, ‘star-shaped’, but not ‘shaped’, ‘superstars’, ‘started’. Below, we see similar results for the search term, ‘Wars’. To accomplish the query with MongoDB, we will use MongoDB’s $text Evaluation Query Operator. The MongoDB $text operator is able to perform a text search across multiple fields indexed with a text index. MongoDB’s text indexes support text search queries on string content. The text indexes can include any field whose value is a string or an array of string elements, such as the movieDetail collection’s genres field. Although not as powerful as Solr’s search capabilities, MongoDB’s text search may address many basic search requirements without the need to augment the architecture with a search engine. For our next query, we will rely on a text index on the title field. When the Python script runs, it creates the following three indexes on the collection, including the title text index. With the text index in place, the result of the queries should be identical, with 18 documents returned. Both the MongoDB and Solr resultsets are scored, however, both are scored differently, using different algorithms. Here is the actual Lucene query (q) Solr will run. The countries filter is applied afterward. Next, we will perform a query for movies, produced in the USA, with the search terms ‘western’, ‘action’, or ‘adventure’ in the movie genres field. The genres field may hold multiple genre values. Although this is a simple query, we can start to see the advantages of Solr’s Lucene scoring capability to provide a way to measure the relevancy of individual results. Even limited to the USA-based movies, this genres query returns a large number of results, 244 documents. With MongoDB, we have no sense of which documents are more relevant than others. Compared to the Solr results, MongoDB got a few in the top five results, but not the most relevant, based on matching all or most of the genres. However, with Solr’s scoring, we see the first (top) result, ‘The Wild Bunch’, has a score of 7.18. It genres contain exactly ‘western’, ‘action’, or ‘adventure’. The last (bottom) result, ‘S.S. Doomtrooper’, has a score of 1.47. The most relevant result scored nearly 5x higher (488%) than the least most relevant result. If you were searching for a western action adventure movie, it is pretty apparent the top Solr result, ‘The Wild Bunch’, is a much better choice than the bottom result, ‘S.S. Doomtrooper’. In fact, as shown below, all five top-scoring Solr results look pretty promising based on their score, genres, and title. There are nearly endless options that can be used with Solr to influence Solr’s results. For example, we could perform the same Solr query above, but this time require that the word ‘western’ is the genres field, by using the plus symbol (+) boolean operator. The top five results and scores are the same, but the total number of relevant results have decreased from 244 to just 24. That means 220 of the previous results contained ‘action’, and/or ‘adventure’, but not ‘western’. The opposite is also true, using the minus symbol (-) boolean operator will ensure the results do not contain a particular word or phrase. 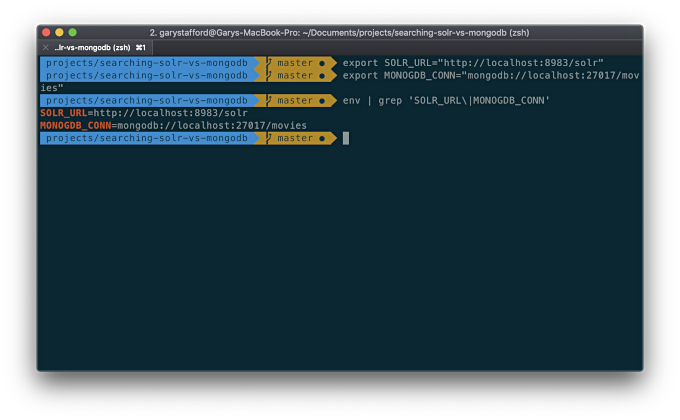 For our next query, we will compare Solr’s eDisMax query parser to MongoDB’s text search capabilities. According to Solr, The DisMax query parser is designed to process simple phrases and to search for individual terms across several fields using different weighting (boosts) based on the significance of each field. Additional options enable users to influence the score based on rules specific to each use case (independent of user input). Solr’s Extended DisMax (eDisMax) query parser is an improved version of the DisMax query parser. In my opinion, in addition to the Lucene-based scoring, the ability to easily search across multiple fields and selectively boost results with the DisMax and eDisMax query parsers is what starts to differentiate querying data in a database, from searching for relevant results with a search engine. For our next query, the Python script will drop the previous MongoDB text index on the title field and create a new compound text index, which will incorporate the title, plot, and genres fields. Below, we see the new compound text index in the MongoDB Compass application’s Indexes tab. We will perform a query for movies, produced in the USA, with the search terms ‘western’, ‘action’, or ‘adventure’ in the movie title, plot, or genres fields. The results of the queries should be identical, with 259 documents returned. Both the MongoDB and Solr resultsets are scored, but again, the scores and ordering of results are not identical. Of the top ten results, the two queries matched six movies in their top ten results. Here is the actual Lucene query Solr will run. If you really wanted a ‘western action adventure’ movie as opposed to a ‘western’, ‘action’, or ‘adventure’ movie, then neither Solr or MongoDB’s probably completely satisfied you with their first five search results. Boosting or weighting fields can often provide more relevant search results if the correct fields are boosted, and the amount of positive or negative boost is appropriate. MongoDB’s text indexes also allow for weighting individual fields. The weight of an indexed field denotes the significance of the field relative to the other indexed fields and directly impacts the text search score. Weighting fields are the equivalent to boosting fields with Solr. Below, we see a modification applied to our previous text index in which the title field is given twice the weight of the plot field (1.0 is default) and the genres field is given twice the weight of the title field. The Python script also applies this index for you. Likewise, Solr is also capable of boosting fields for both the DisMax and eDisMax query parsers. For our next query, we will repeat the previous query, but boost fields in the eDisMax’s qf (Query Fields) parameter to match the boost in the MongoDB weighted text index, shown above. The results of the queries should be identical, with 259 documents returned. MongoDB and Solr’s results are scored and ordered differently. However, compared to the previous, un-weighted/boosted MongoDB and Solr query results above, the relative scores are higher, the order of movies returned are different, and most importantly, the Solr results seem more relevant to the original search intent. For example with Solr, take the movie, ‘The Secret Life of Walter Mitty’, which previously scored highest at 7.58. In the boosted search results, the movie, ‘The Wild Bunch’ is now ranked first with a score of 28.71. The movie, ‘The Secret Life of Walter Mitty’ is no longer even in the top 50 Solr results. Comparatively, other movies, like ‘The Adventures of Tintin’ and ‘Adventures in Babysitting’, barely moved in position even though their scores changed proportionally. We can use both the plus (+) and minus (-) boolean operators to obtain more relevant search results. Let’s repeat the last Solr boosted query, but this time, also require any results to contain the search term, ‘western’, and prohibit the responses from containing the search term, ‘romance’. I would consider the new search results, based these modifications to the Solr query, to be more relevant to the original intent of the search, than the previous results. For example, the movie, ‘The Big Trail’, a romantic western adventure movie, according to its genres, is no longer included in the results sets. Frequently, end-users interact with a search engine, such as Google, through a search box. We type something into a search box and get back a list of relevant results. By now, most of us have learned how to phrase our Google search to get optimal results. However, the reality is, people can and will type just about anything into a search box. To try and improve the average search results for end-users, search engineers will often try to tune query parameters, such as boosting the importance certain search fields over other, adjusting fuzzy search parameters, or ignore irrelevant words in the search phases by adding them to the stop words. Default English in Solr stop words include like: ‘a’, ‘an’, ‘and’, ‘are’, ‘as’, ‘at’, ‘be’, ‘but’, ‘by’, ‘for’, and so forth. Take, for example, the word ‘movie’. Someone searching for a movie to watch, using a search box, might enter the phrase ‘A cowboy movie’. The term, ‘A’, is ignored as a stop word. This leaves the search terms ‘cowboy’ and ‘movie’ to be searched for in the title, plot, and genres fields. As we see by the top ten results below, most appear to be about cowboys, having the word ‘cowboy’ in their title or plot. Then there is the result, ‘TV: The Movie’. This does not appear to be a movie about cowboys. The word ‘cowboy’ is not in the title, plot, or genres, yet here it is in third place since it contains the word ‘movie’ in the title, plot, and/or genres. Similarly, the top movie result, ‘Cowboy Bebop: The Movie’, is probably no more relevant than the second, third, or fourth place movies. However, ‘Cowboy Bebop: The Movie’ has scored significantly higher than even the number two results (11.24 vs. 7.31). This is because the movie’s title contains both search terms, ‘cowboy’ and ‘movie’, even though the word ‘movie’ is irrelevant to the original intent of the search phrase. To solve the movie dilemma, we might consider adding the word ‘movie’ to the stop words, since the word ‘movie’ seems to be irrelevant to the search phrase ‘A cowboys movie’, or to a movie search engine in general. However, this choice will negatively impact other searches. There are 12 movie titles containing the word ‘movie’. If you were searching for ‘The Lego Movie’, ignoring the word ‘movie’, as a stop word, would negatively impact the accuracy and relevance of your search results. You would end up with only one of two Lego movies in your search results, the one without the title that contained the word ‘movie’. Note only one of the two Lego movies is returned. Here is the actual Lucene query Solr will run. Note neither the term ‘a’ and ‘movie’ are part of the search. A second method to solve the movie dilemma might be to negatively boost the word ‘movie’ when it appears in the title field, thus reducing its relevance. Negatively boosting fields, or more precisely, negatively boosting a specific field value, is possible with both the DisMax and eDisMax query parsers. We can assign a negative boost to the word ‘movie’ when it appears in the title field, by using the bq (Boost Query) parameter. According to Solr, The bq parameter specifies an additional, optional, query clause that will be added to the user’s main query to influence the score. As Developers, we could programmatically append the negatively boosted term(s) into the query without directly altering the user’s original search phrase. Again, like stop words, boosting may also negatively impact other searches. After some experimentation, we will try a boost value of -2. We still get 23 results, however, the top ten results now appear to be more relevant, based on the intent of our search phrase. The movies, ‘Cowboy Bebop: The Movie’ and ‘TV: The Movie’ are not present in the top ten results; their scoring was lowered. You can repeat this process for more search terms, like ‘movie’, positively or negatively boosting their scores, to improve the relevancy of the results. Here is the actual Lucene query Solr will run, accounting for the negative boost. Solr’s Lucene scoring is effective, but what if we wanted to use an additional, subjective measure of relevance to enrich our search results? If we examine the movies index schema, we will see there are quite a few rating-related fields that provide a sense of the movie’s quality, as judged by viewers and organizations. For example, there is a nested ‘tomato’ object, containing a number of qualitative data fields, such as the tomato rating and a tomato user rating. Tomato refers to Rotten Tomatoes. According to their site, Rotten Tomatoes provides the world’s most trusted recommendation resources for quality entertainment. Additionally, the movies index schema includes similar ‘awards’ and ‘imdb’ objects and a ‘metacritic’ rating. Here is a snippet of data from the movie, ‘Butch Cassidy and the Sundance Kid’, showing many of those qualitative fields. "text": "Won 4 Oscars. Another 16 wins & 14 nominations." According to Apache, Lucene scoring is a combination of the Vector Space Model (VSM) of Information Retrieval and the Boolean model. Lucene allows influencing search results by ‘boosting’. Using the Solr’s Function Query, we can apply a document-level multiplicative boost function, which will alter the scores of the query’s search results. If you remember in our previous example, we queried for ‘adventure action +western -romance’. If we run it again, without the boosted fields, we got back 25 documents, of which ‘Western Union’ ranked highest, with a score of 7.39. Now, we will apply a boost function. In the function below, I have arbitrarily taken the number of awards won by each movie and divided it in half. The function is applied to the eDisMax’s boost parameter. This function has a multiplicative effect on the Lucene scoring of the documents in the result set, by boosting scores in proportion to the number of awards each movie has won. We now get movies that are a blend of both relevant results, based on our search phrase, as well as those movies that are highly acclaimed. The impact of the multiplicative boost function is immediately apparent with the top result, ‘Butch Cassidy and the Sundance Kid’. This widely acclaimed movie climbed from fifth place in the previous search to first place, using the boost formula. The movie, ‘Butch Cassidy and the Sundance Kid’, won an amazing 16 awards, which is 16 more than that of the previous first place movie, ‘Western Union’, which won no awards, moving it down all the way down to 17th place in the boosted results. A movie that wasn’t even in the top five results, ‘Wild Wild West’, is now in second place, having received ten awards. The impact of the boost function is most apparent in the scores. Previously, the score delta between the first and fifth positions in the results was 1.16. The delta between the first and second position was a mear 0.21. Now, with the boost function applied, the range of scoring, and consequently, the two deltas increased significantly, 36.78 compared to 1.16 and 23.83 compared to 0.21. Here is the actual Lucene query Solr will run, using the boost function. Solr’s Function Query offers a large number of mathematical functions, which can be combined into complex formulas. For example, we could also take the square root of the sum of the IMDB rating and the number of award nominations. In the first MLTQParser query, we will select the movie, ‘Star Wars: Episode I – The Phantom Menace’. We will look for more movies, produced in the USA, that are similar to ‘Star Wars: Episode I – The Phantom Menace’, by looking for similarities in the genres field. The MLTQParser’s qf field specifies the fields to use for similarity. We will require amintf (Minimum Term Frequency) of 1. This is the frequency below which search terms will be ignored in the source document. We will also require a mindf (Minimum Document Frequency) of 1. This is the frequency at which words will be ignored when they do not occur in at least this many documents. The results of the Solr search appear logical, they are the other five Star Wars movies. Note that since the first five results are exact matches on The Phantom Menace’s three genres, ‘action’, ‘adventure’, and ‘fantasy’, their scores are identical, 6.33. In the second MLTQParser query example, we will again choose the movie, ‘Star Wars: Episode I – The Phantom Menace’. However, this time will look for similar movies based on a comparison of the actors, director, and writers fields (shown below). Basically, we are looking for similarities between the people associated with ‘Star Wars: Episode I – The Phantom Menace’ and other movies. As you can tell by the results of the MLTQParser query below, the first nine out of ten search results make sense. However, the tenth movie result, ‘New Meet Me on South Street: The Story of JC Dobbs’, has no obvious similarities with ‘Star Wars: Episode I – The Phantom Menace’. The movie does not share a common director, writer, or actor. Here is the actual Lucene query Solr run. Examining the query, we can plainly see the problem with MLTQParser. The MLTQParser query is splitting the first and last names of actors, directors, and writers, then searching for each name individually, but not their whole name. In my opinion, this is a bug with the MLTQParser, since each value in the actors, director, and writers MultiValued fields are wrapped in double quotes. The query should treat each value an exact phrase, not individual search terms. Given the MLTQParser’s query logic, it is now clear why a seemingly irrelevant movie, like ‘New Meet Me on South Street: The Story of JC Dobbs’, was part of the search results. Examining the debug output of the scoring explanation, we see the following. George Manney was both the Director and Writer of ‘New Meet Me on South Street: The Story of JC Dobbs’. George Manney shares a first name with George Lucas, the Director and Writer of ‘Star Wars: Episode I – The Phantom Menace’. This is the only similarity between people associated with both movies. Therefore, there were two matches, one match on the director fields and a match on the writers field. Unfortunately, having the same first names negatively impacts the results from the MLTQParser. For our last example, we will examine the use of synonyms with Solr. In respect to the movie index, we could perform the following eDisMax search on the title, plot, and genres fields: ‘scary’ OR ‘slasher’ OR ‘spooky’ OR ‘evil’ OR ‘horror’, or more simply ‘scary slasher spooky evil horror’. Based on this search, we would get back a truly gruesome collection of 141 films. The search is effective because it uses multiple, similar search terms to return a larger resultset of movies within a similar theme. However, the search relies on each end-user to enter the same relevant search terms, every time. With Solr’s synonym capability, we can build some intelligence into our index by defining synonymous relationships between terms. There are multiple ways to define synonymous relationships between terms in Solr. Lucidworks has an excellent article, Synonyms Files, on the different synonymous relationships. We will look at three types of relationships, as described by Lucidworks: Replacement Synonyms, Oneway Expansion Synonyms, and Multiway Expansion Synonyms. I have pre-define some examples for each of the three types of relationships, in the movies index’s synonmys.txt configuration file. This file is created when a new index is created. There is a copy of the file in this project, which will be used by the movies index, running in the Docker container. We will start with a Replacement Synonyms example. I have added the following synonym mapping for a common misspelling of the word ‘cyborg’. If we perform a search for the term ‘ciborg’, Solr will substitute it with the term ‘cyborg’. We can confirm this by viewing the query, as shown in the debug snippet below. Performing the query returns two documents, including the most famous cyborg, Arnold Schwarzenegger, the Terminator. Next, we will demonstrate Oneway Expansion Synonyms. I have added the following synonym mapping for the word, ‘droid’. Note we must include the word ‘droid’ in the expansion synonyms on the right side of the mapping, as well as on the left. When we perform a search on the term ‘droid’, Solr will also search for the synonyms ‘android’, ‘robot’, and ‘cyborg’. We can confirm this by viewing the query Solr constructs for the search term ‘droid’, as shown in the debugger snippet below. Note the converse is not true since this is a one-way relationship. If we search on ‘cyborg’, Solr will not search on ‘droid’, ‘android’, and ‘robot’. Performing the ‘droid’ eDisMax query returns 15 documents. Lastly, we will demonstrate Multiway Expansion Synonyms. I have added the following synonym mapping for the word, ‘scary’. If we perform a search on the term ‘scary’, Solr will also search for the synonyms ‘slasher’, ‘spooky’, ‘evil’, and ‘horror’. Unlike the previous example, the converse is true since this is a multi-way relationship. If we search on any of the five synonyms, Solr will also search on the other four terms and return identical results. We can confirm this by viewing the query Solr constructs for the term ‘scary’, as shown in the debug snippet below. Performing the ‘scary’ eDisMax query returns 141 documents. 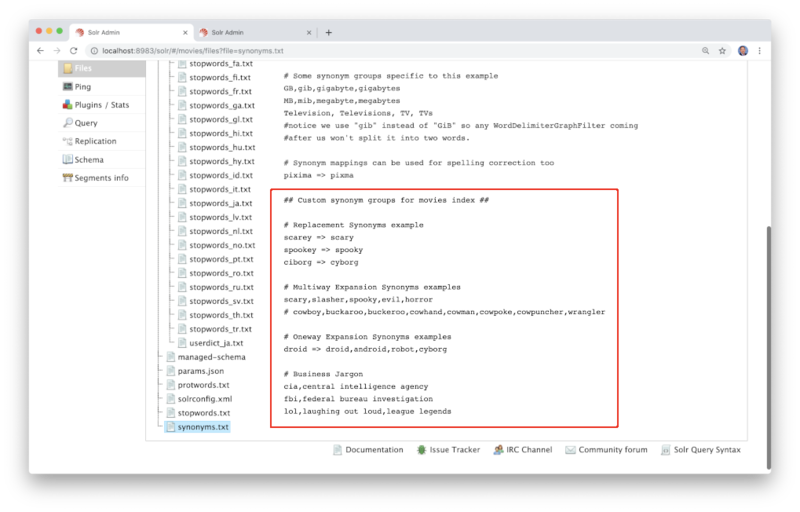 You may have noticed the other replacement synonym mapping I placed in the index’s synonmys.txt configuration file, shown below. You might be wondering if you entered the common misspelling ‘scarey’ as a search term, would Solr replace the term with ‘scary’ and search on the term ‘scary’, but also search on it’s four synonyms, ‘slasher’, ‘spooky’, ‘evil’, and ‘horror’. The answer is no, Solr will only search on ‘scary’. However, Solr does not create indirect or secondary relationships between synonym mappings. You would have to correct the spelling and input the term correctly to take advantage of the multi-way relationship. Large corporations, industry verticles, government agencies, and other entities often use a unique lexicon. Their vocabulary includes uncommon terms, phrases, acronyms, abbreviations, and other idioms. These commonly represent products and services, organizational structures, and technical jargon. Synonyms are an excellent way to support domain-specific dictions within indexes. We see this in the examples Solr includes in the synonmys.txt configuration file. The two examples, shown below, demonstrate how associate multiple abbreviations and technical terms to equivalent amounts of compute. A largely undocumented feature of synonyms is the ability to create synonymous relationships between common acronyms, abbreviations, terms, and phrases. Below I have provided a few examples of how to create these relationships. The only apparent, logical limitation, you cannot use stop words in the phrases; a good reason not to overuse stop words. For example, If we include the full phrase ‘league of legends’ in the synonyms map with ‘lol’, Solr ignores this phrase when I search on ‘LOL’. However, if we remove the stop word, ‘of’, then Solr will create a query that requires the two terms, ‘league’ and ‘legends’, or the two terms ‘laugh’ and ‘loud’, or the single term ‘lol’. By understanding the capabilities of Apache Solr, the characteristics of the data contained in your indexes and the search patterns of your end users, you will be able to craft queries that ensure responses contain high-quality, relevant search results. The query examples in this post demonstrate only a very small portion of Solr’s vast search capabilities. There are several additional query examples available in each of the two Python scripts, which you can uncomment and explore their results, further. Solr’s documentation is very good; to learn more about Solr’s capabilities, I suggest reviewing the various parsers and their options, in the current Solr version 7.6 documentation. I also suggest reviewing Solr’s Analyzers, Tokenizers, and Filters, and understand how they affect the way in which Solr indexes documents and how Solr interprets the content of the indexes when performing a search. A few recent articles on developing Alexa Skills on the AWS platform, LUIS-enabled Chatbots on the Microsoft Azure platform, and Actions for Google Assistant on GCP. In this post, we will explore the use of Ansible, the open source community project sponsored by Red Hat, for automating the provisioning, configuration, deployment, and testing of resources on the Google Cloud Platform (GCP). We will start by using Ansible to configure and deploy applications to existing GCP compute resources. We will then expand our use of Ansible to provision and configure GCP compute resources using the Ansible/GCP native integration with GCP modules. Ansible, purchased by Red Hat in October 2015, seamlessly provides workflow orchestration with configuration management, provisioning, and application deployment in a single platform. Unlike similar tools, Ansible’s workflow automation is agentless, relying on Secure Shell (SSH) and Windows Remote Management (WinRM). Ansible has published a whitepaper on The Benefits of Agentless Architecture. According to G2 Crowd, Ansible is a clear leader in the Configuration Management Software category, ranked right behind GitLab. Some of Ansible’s main competitors in the category includes GitLab, AWS Config, Puppet, Chef, Codenvy, HashiCorp Terraform, Octopus Deploy, and TeamCity. There are dozens of published articles, comparing Ansible to Puppet, Chef, SaltStack, and more recently, Terraform. According to Google, Google Compute Engine (GCE) delivers virtual machines (VMs) running in Google’s data centers and on their worldwide fiber network. Compute Engine’s tooling and workflow support enables scaling from single instances to global, load-balanced cloud computing. Comparable products to GCE in the IaaS category include Amazon Elastic Compute Cloud (EC2), Azure Virtual Machines, IBM Cloud Virtual Servers, and Oracle Compute Cloud Service. According to Apache, the Apache HTTP Server (“httpd”) is an open-source HTTP server for modern operating systems including Linux and Windows. The Apache HTTP Server provides a secure, efficient, and extensible server that provides HTTP services in sync with the current HTTP standards. The Apache HTTP Server was launched in 1995 and it has been the most popular web server on the Internet since 1996. We will deploy Apache HTTP Server to GCE VMs, using Ansible. In this post, we will demonstrate two different workflows with Ansible on GCP. First, we will use Ansible to configure and deploy the Apache HTTP Server to an existing GCE instance. In the second workflow, we will use Ansible to provision and configure the GCP resources, as well as deploy the Apache HTTP Server the new GCE VM. The source code for this post may be found on the master branch of the ansible-gcp-demo GitHub repository. The project has the following file structure. Source code samples in this post are displayed as GitHub Gists which may not display correctly on all mobile and social media browsers, such as LinkedIn. 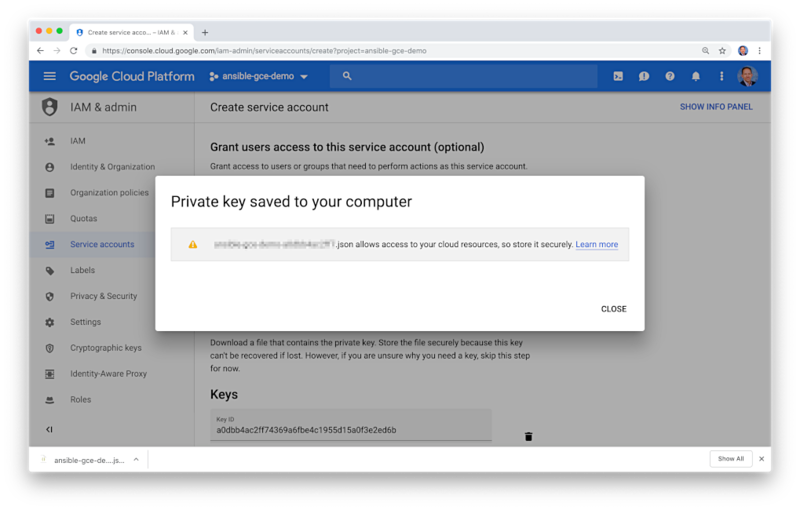 For this demonstration, I have created a new GCP Project containing a new service account and public SSH key. The project’s service account will be used the gcloud CLI tool and Ansible to access and provision compute resources within the project. The SSH key will be used by both tools to SSH into GCE VM within the project. Start by creating a new GCP Project. Add a new service account to the project on the IAM & admin ⇒ Service accounts tab. Grant the new service account permission to the ‘Compute Admin’ Role, within the project, using the Role drop-down menu. The principle of least privilege (PoLP) suggests we should limit the service account’s permissions to only the role(s) necessary to provision the required compute resources. Create a private key for the service account, on the IAM & admin ⇒ Service accounts tab. This private key is different than the SSH key will add to the project, next. This private key contains the credentials for the service account. Choose the JSON key type. Download the private key JSON file and place it in a safe location, accessible to Ansible. Be careful not to check this file into source control. Again, this file contains the service account’s credentials used to programmatically access GCP and administer compute resources. We should now have a service account, associated with the new GCP project, with permissions to the ‘Compute Admin’ role, and a private key which has been downloaded and accessible to Ansible. Note the Email address of the service account, in my case, ansible@ansible-gce-demo.iam.gserviceaccount.com; you will need to reference this later in your configuration. Next, create an SSH public/private key pair. The SSH key will be used to programmatically access the GCE VM. 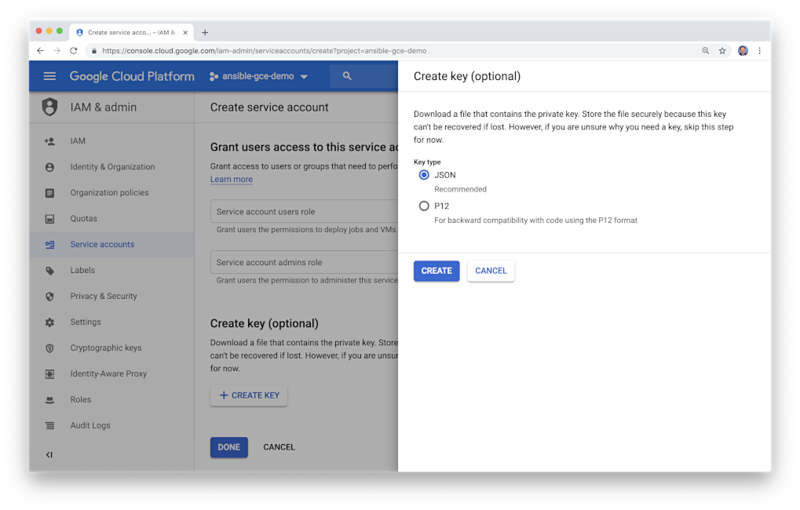 Creating a separate key pair allows you to limit its use to just the new GCP project. 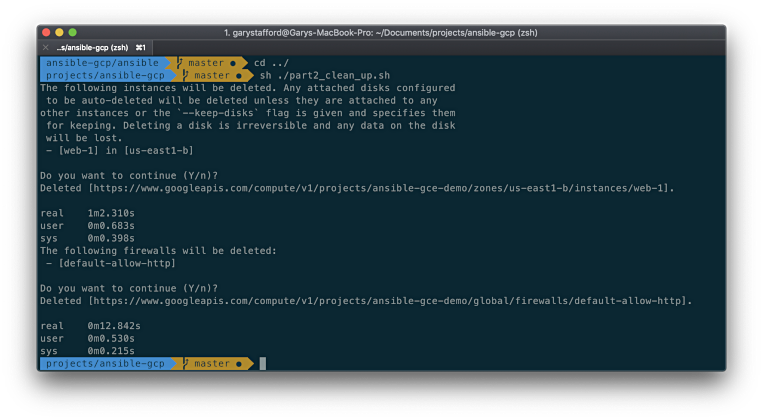 If compromised, the key pair is easily deleted and replaced in the GCP project and in the Ansible configuration. On a Mac, you can use the following commands to create a new key pair and copy the public key to the clipboard. 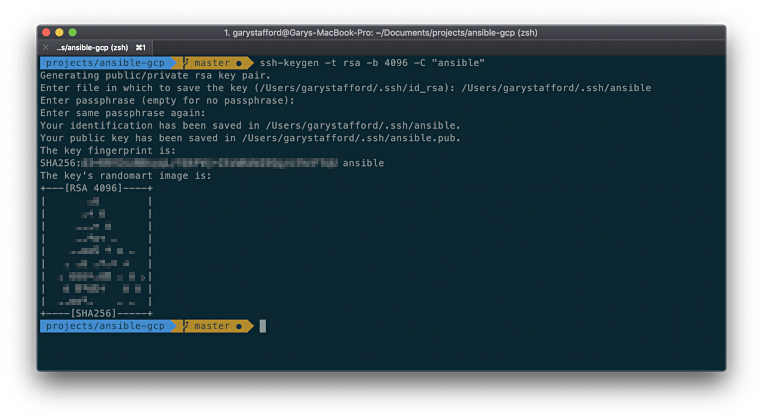 ssh-keygen -t rsa -b 4096 -C "ansible"
Add your new public key clipboard contents to the project, on the Compute Engine ⇒ Metadata ⇒ SSH Keys tab. Adding the key here means it is usable by any VM in the project unless you explicitly block this option when provisioning a new VM and configure a key specifically for that VM. Note the name, ansible, associated with the key, you will need to reference this later in your configuration. 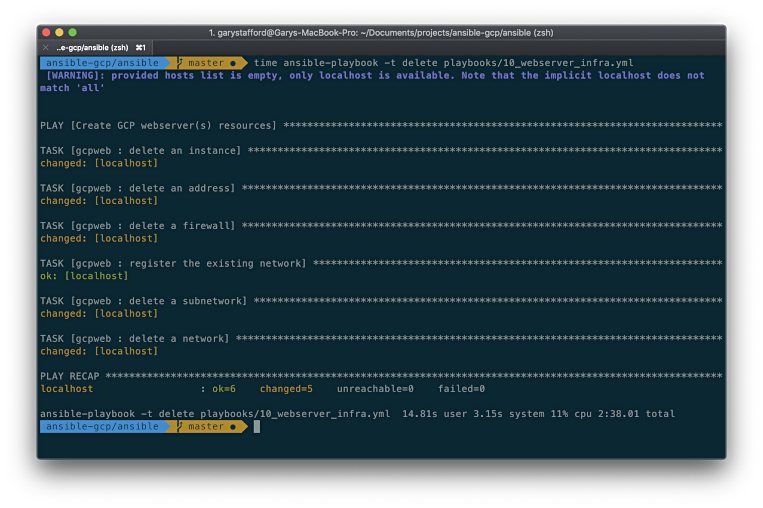 Although this post is not a primer on Ansible, I will cover a few setup steps I have done to prepare for this demo. 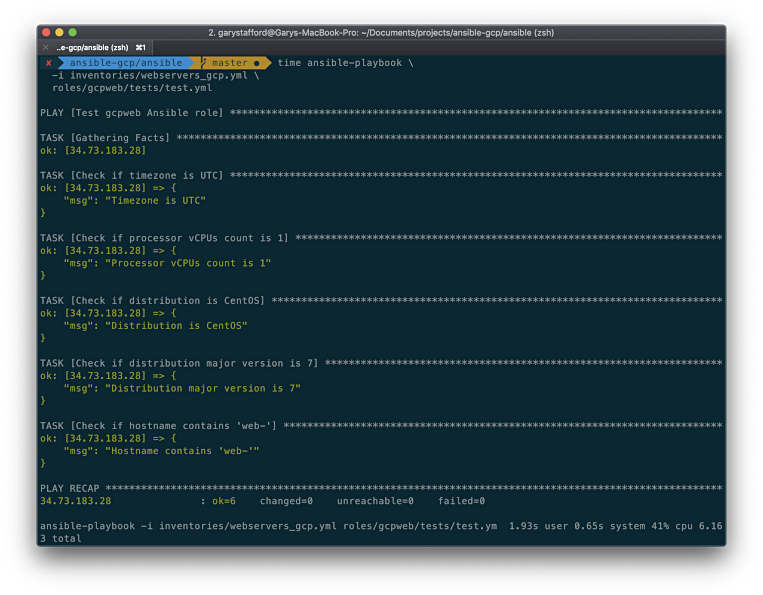 On my Mac, I am running Python 3.7, pip 18.1, and Ansible 2.7.6. 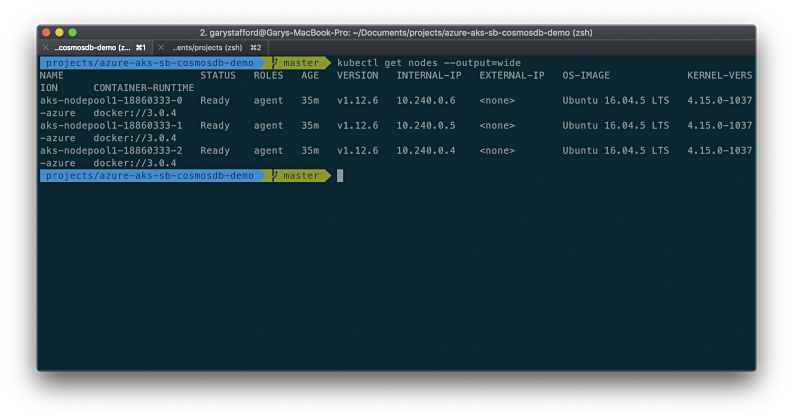 With Python and pip installed, the easiest way to install Ansible in Mac or Linux is using pip. You will also need to install two additional packages in order to gather information about GCP-based hosts using GCE Dynamic Inventory, explained later in the post. 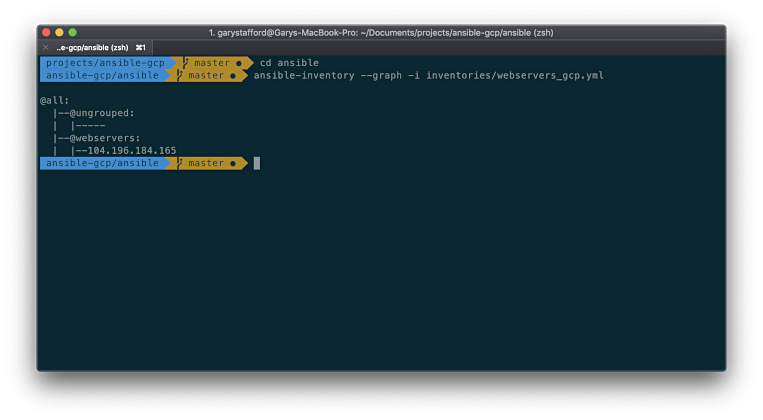 I created a simple Ansible ansible.cfg file for this project, located in the /ansible/inventories/ sub-directory. The Ansible configuration file contains the location of the project’s roles and inventory, which is explained later. The file also contains two configuration items associated with an SSH key pair, which we just created. If your key is named differently or in a different location, update the file (gist). 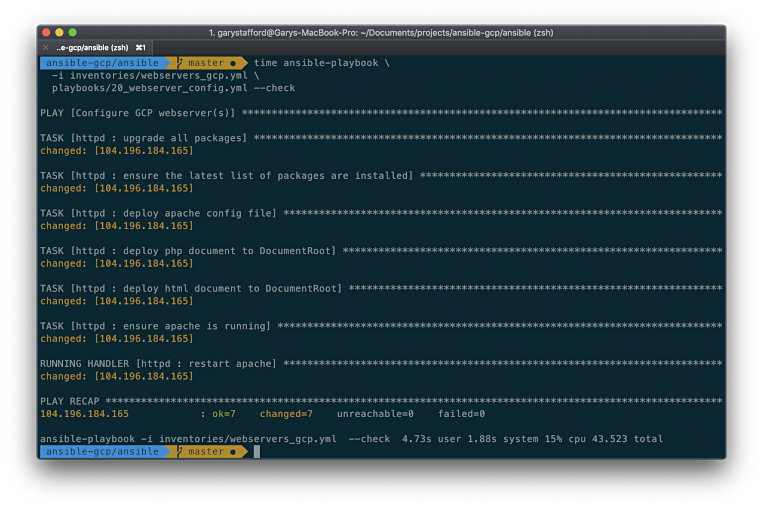 Ansible has a complete example of a configuration file parameters on GitHub. 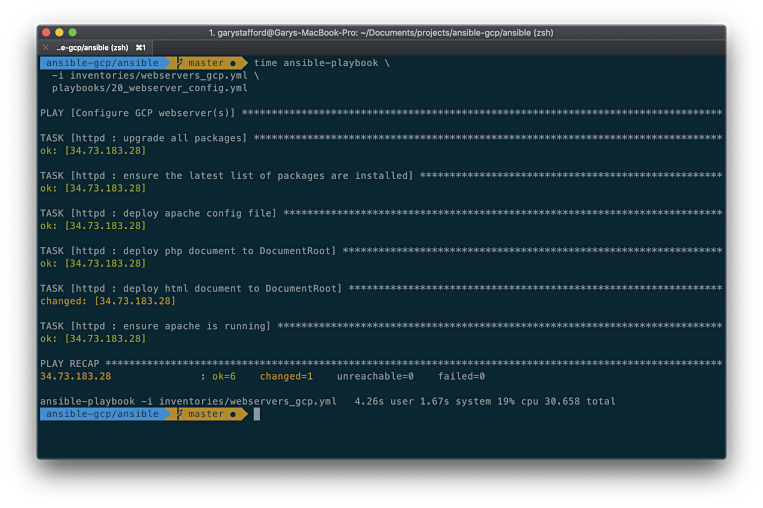 To decouple our specific GCP project’s credentials from the Ansible playbooks and roles, Ansible recommends setting those required module parameters as environment variables, as opposed to including them in the playbooks. 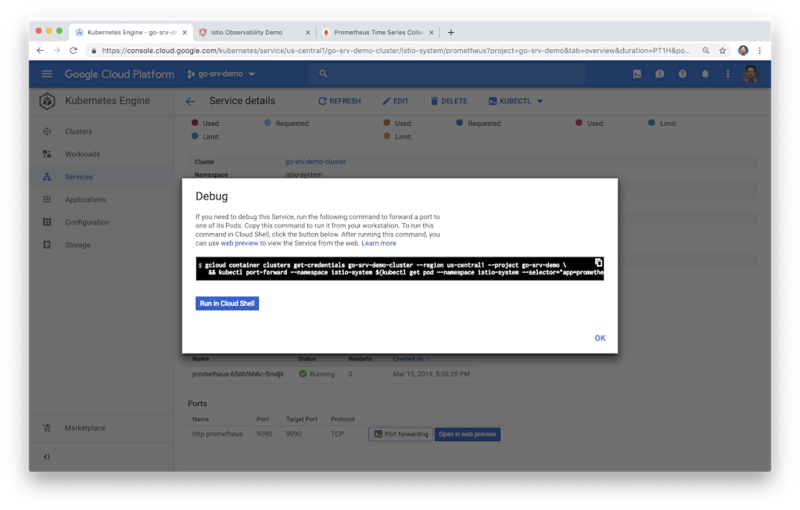 Additionally, I have set the GCP project name as an environment variable, in order to also decouple it from the playbooks. To set those environment variables, source the part0_source_creds.sh script in the project’s root directory, using the source command (gist). Oftentimes, enterprises employ a mix of DevOps tooling to provision, configure, and deploy to compute resources. 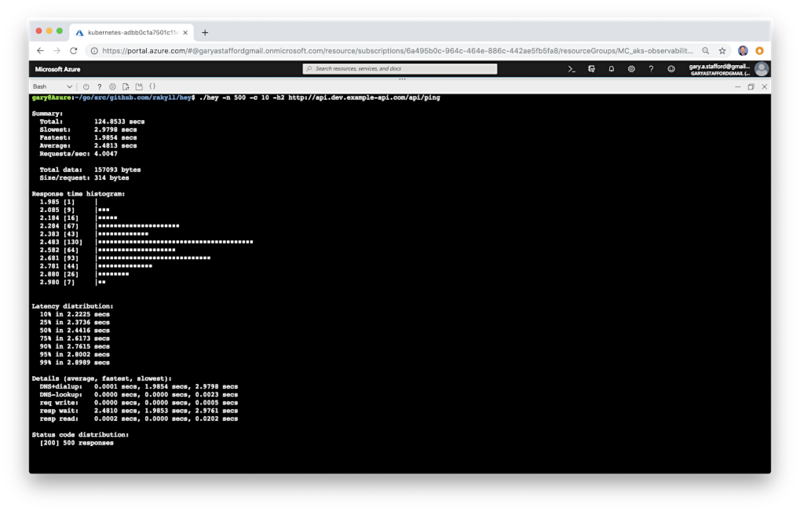 In this first workflow, we will use Ansible to configure and deploy a web server to an existing GCE VM, created in advance with the gcloud CLI tool. 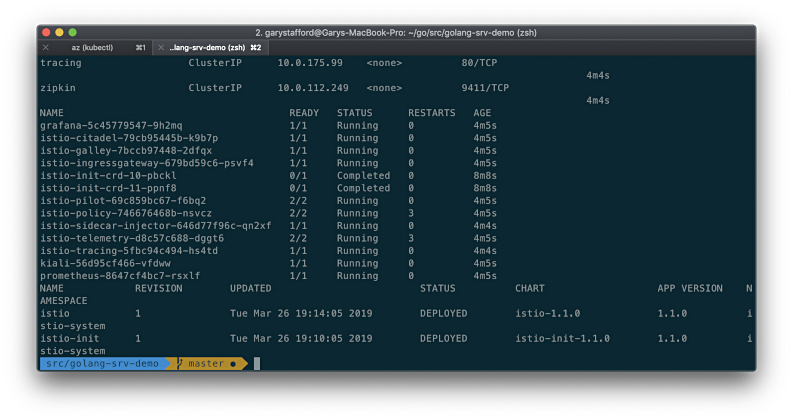 First, use the gcloud CLI tool to create a GCE VM and associated resources, including an external IP address and firewall rule for port 80 (HTTP). For simplicity, we will use the existing GCP default Virtual Private Cloud (VPC) network and the default us-east1 subnetwork. Execute the part1_create_vm.sh script in the project’s root directory. The default network should already have port 22 (SSH) open on the firewall. Note the SERVICE_ACCOUNT variable, in the script, is the service account email found on the IAM & admin ⇒ Service accounts tab, shown in the previous section (gist). The output from the script should look similar to the following. Note the external IP address associated with the VM, you will need to reference this later in the post. 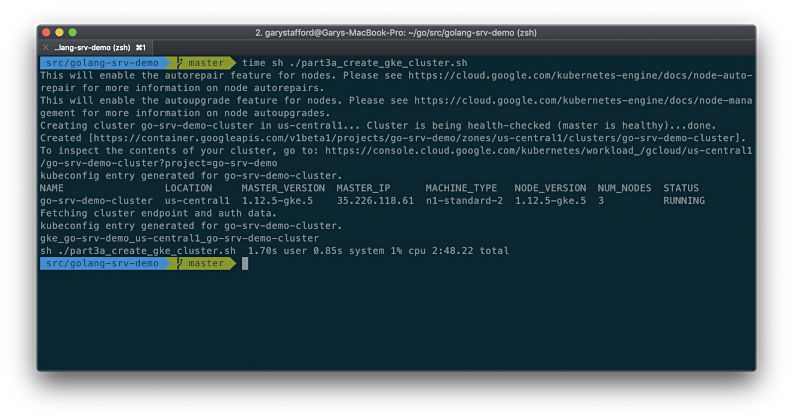 Using the gcloud CLI tool or Google Cloud Console, we should be able to view our newly provisioned resources on GCP. First, our new GCE VM, using the Compute Engine ⇒ VM instances ⇒ Details tab. Next, examine the Network interface details tab. Here we see details about the network and subnetwork our VM is running within. We see the internal and external IP addresses of the VM. We also see the firewall rules, including our new rule, allowing TCP ingress traffic on port 80. Lastly, examine the new firewall rule, which will allow TCP traffic on port 80 from any IP address to our VM, located in the default network. Note the other, pre-existing rules controlling access to the default network. The final GCP architecture looks as follows. Two core concepts in Ansible are hosts and inventory. 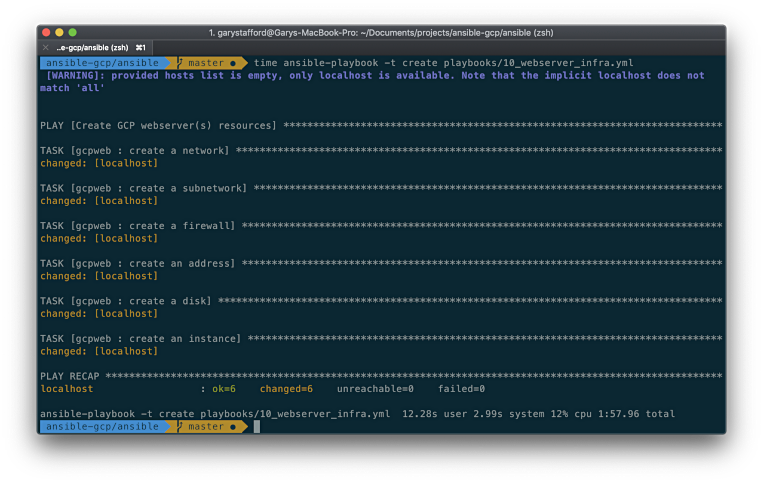 We need an inventory of the hosts on which to run our Ansible playbooks. If we had long-lived hosts, often referred to as ‘pets’, who had long-lived static IP addresses or DNS entries, then we could manually add the hosts to a static hosts file, similar to the example below. However, given the ephemeral nature of the cloud, where hosts (often referred to as ‘cattle’), IP addresses, and even DNS entries are often short-lived, we will use the Ansible concept of Dynamic Inventory. If you recall we pip installed two packages, requests and google-auth, during our Ansible setup for use with GCE Dynamic Inventory. According to Ansible, the best way to interact with your GCE VM hosts is to use the gcp_compute inventory plugin. The plugin allows Ansible to dynamically query GCE for the nodes that can be managed. With the gcp_compute inventory plugin, we can also selectively classify the hosts we find into Groups. We will then run playbooks, containing roles, on a group or groups of hosts. To demonstrate how to dynamically find the new GCE host, and add it to a group, execute the following command, using the Ansible Inventory CLI. The command calls the webservers_gcp.yml file, which contains logic necessary to associate the GCE hosts with the webservers host group. Ansible’s current documentation is pretty sparse on this subject. Thanks to Matthieu Remy for his great post, How to Use Ansible GCP Compute Inventory Plugin. For this demo, we are only looking for hosts in us-east1-b, which have ‘web-’ in their name. (gist). The output from the command should look similar to the following. We should observe our new VM, as indicated by its external IP address, is assigned to the part of the webservers group. We will use the power of Dynamic Inventory to apply a playlist to all the hosts within the webservers group. We can also view details about hosts by modifying the inventory command. The output from the command should look similar to the following. This particular example was run against an earlier host, with a different external IP address. 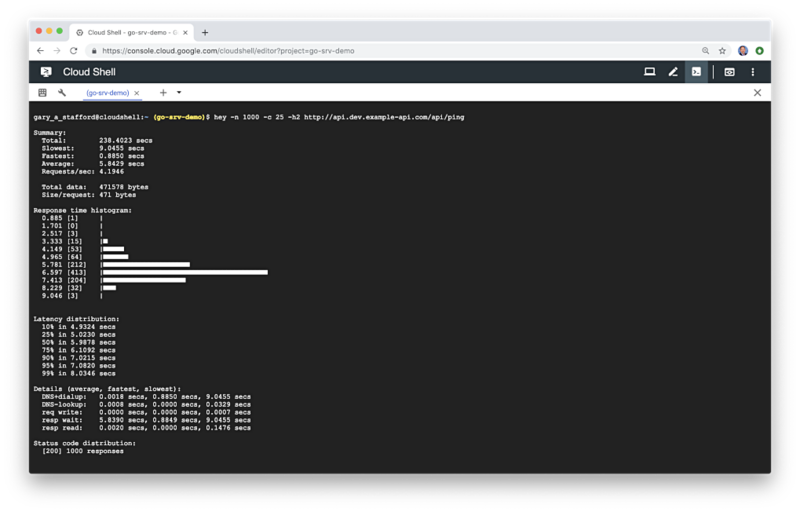 For our first taste of Ansible on GCP, we will run an Ansible Playbook to install and configure the Apache HTTP Server on the new CentOS-based VM. According to Ansible, Playbooks, which are YAML-based, can declare configurations, they can also orchestrate steps of any manual ordered process, even as different steps must bounce back and forth between sets of machines in particular orders. They can launch tasks synchronously or asynchronously. Playbooks are used to orchestrate tasks, as opposed to using Ansible’s ad-hoc task execution mode. A playbook can be ‘monolithic’ in nature, containing all the required Variables, Tasks, and Handlers, to achieve the desired outcome. If we wrote a single playbook to deploy and configure our Apache HTTP Server, it might look like the httpd_playbook.yml, playbook, below (gist). We could run this playbook with the following command to deploy the Apache HTTP Server, but we won’t. Instead, next, we will run a playbook that applies the httpd role. According to Ansible, Roles are ways of automatically loading certain vars_files, tasks, and handlers based on a known file structure. Grouping content by roles also allows easy sharing of roles with other users. The usage of roles is preferred as it provides a nice organizational system. The httpd role is identical in functionality to the httpd_playbook.yml, used in the first workflow. However, the primary parts of the playbook have been decomposed into individual resource files, as described by Ansible. This structure is created using the Ansible Galaxy CLI. Ansible Galaxy is Ansible’s official hub for sharing Ansible content. This ansible-galaxy command creates the following structure. I added the files and Jinja2 template, afterward. To apply the httpd role, we will run the 20_webserver_config.yml playbook. Compare this playbook, below, with the previous, monolithic httpd_playbook.yml playbook. All of the logic has now been decomposed across the httpd role’s separate backing files (gist). We can start by running our playbook using Ansible’s Check Mode (“Dry Run”). When ansible-playbook is run with --check, Ansible will not make any actual changes to the remote systems. According to Ansible, Check mode is just a simulation, and if you have steps that use conditionals that depend on the results of prior commands, it may be less useful for you. However, it is great for one-node-at-time basic configuration management use cases. Execute the following command using Check mode. The output from the command should look similar to the following. It shows that if we execute the actual command, we should expect seven changes to occur. If everything looks good, then run the same command without using Check mode. The output from the command should look similar to the following. Note the number of items changed, seven, is identical to the results of using Check mode, above. If we were to execute the command using Check mode for a second time, we should observe zero changed items. This means the last command successfully applied all changes and no new changes are present in the playbook. There are a number of methods and tools we could use to test the deployments of the Apache HTTP Server and server tools. 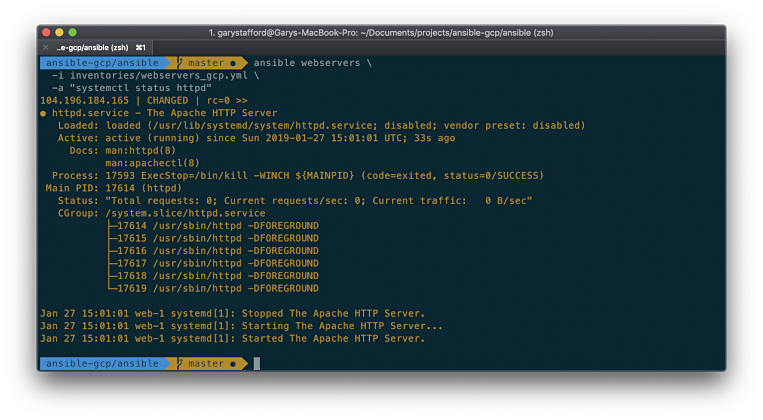 First, we can use an ad-hoc ansible CLI command to confirm the httpd process is running on the VM, by calling systemctl. The systemctl application is used to introspect and control the state of the systemd system and service manager, running on the CentOS-based VM. The output from the command should look similar to the following. We see the Apache HTTP Server service details. We also see it being stopped and started as required by the tasks and handler in the role. We can also check that the home page and PHP info documents, we deployed as part of the playbook, are in the correct location on the VM. The output from the command should look similar to the following. We see the two documents we deployed are in the root of the website directory. Next, view our website’s home page by pointing your web browser to the external IP address we created earlier and associated with the VM, on port 80 (HTTP). 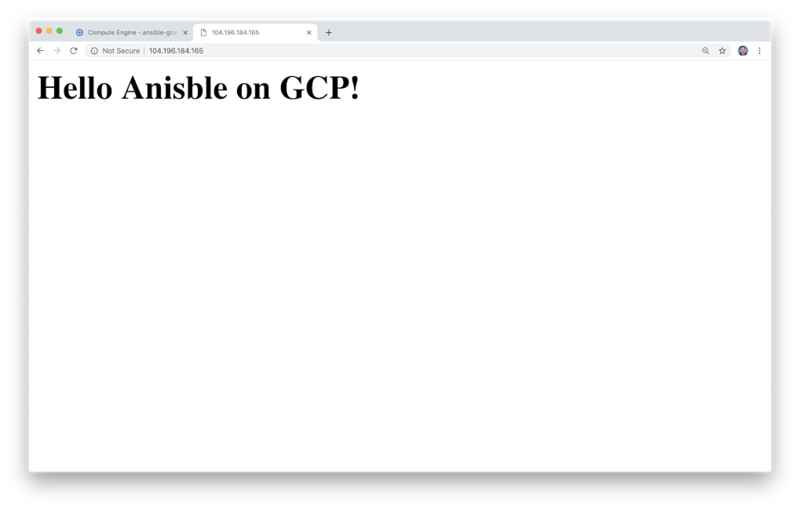 We should observe the variable value in the playbook, ‘Hello Ansible on GCP!’, was injected into the Jinja2 template file, index.html.j2, and the page deployed correctly to the VM. If you recall from the httpd role, we had a task to deploy the server status configuration file. This configuration file exposes the /server-status endpoint, as shown below. 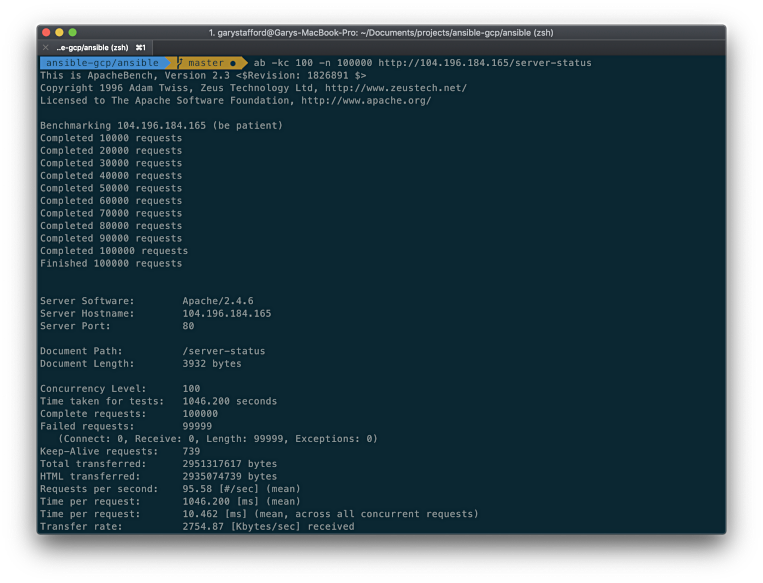 The status page shows the internal and the external IP addresses assigned to the VM. It also shows the current version of Apache HTTP Server and PHP, server uptime, traffic, load, CPU usage, number of requests, number of running processes, and so forth. Apache Bench (ab) is the Apache HTTP server benchmarking tool. We can use Apache Bench locally, to generate CPU, memory, file, and network I/O loads on the VM. For example, using the following command, we can generate 100K requests to the server-status page, simulating 100 concurrent users. The output from the command should look similar to the following. Observe this command successfully resulted in a sustained load on the web server for approximately 17.5 minutes. Using the Compute Engine ⇒ VM instances ⇒ Monitoring tab, we see the corresponding Apache Bench CPU, memory, file, and network load on the VM, starting at about 10:03 AM, soon after running the playbook to install Apache HTTP Server. After exploring the results of our workflow, tear down the existing GCE resources before we continue to the next workflow. To delete resources, execute the part2_clean_up.sh script in the project’s root directory (gist). The output from the script should look similar to the following. In the second workflow, we will provision and configure the GCP resources, and deploy Apache HTTP Server to the new GCE VM using Ansible. We will be using the same Project, Region, and Zone as the previous example. However this time, we will create a new global VPC network instead of using the default network as before, a new subnetwork instead of using the default subnetwork as before, and a new firewall with ingress rules to open ports 22 and 80. Lastly, will create an external IP address and assign it to the VM. 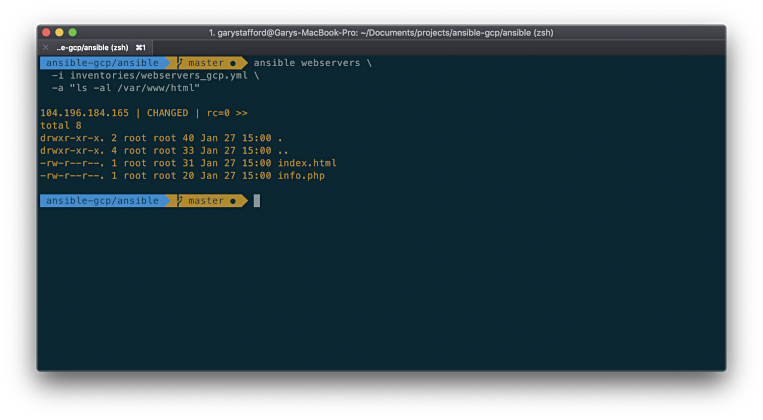 Instead of using the gcloud CLI tool, we will use Ansible to provision the GCP resources. To accomplish this, I have created one playbook, 10_webserver_infra.yml, with one role, gcpweb, but two sets of tasks, one to create the GCE resources, create.yml, and one to delete the GCP resources, delete.yml. This is a typical Ansible playbook pattern. The standard file directory structure of the role looks as follows, similar to the httpd role. To provision the GCE resources, we run the 10_webserver_infra.yml playbook (gist). This playbook runs the gcpweb role. The role’s default main.yml task file imports two other sets of tasks, one for create and one for delete. Each set of tasks have a corresponding tag associated with them (gist). By calling the playbook and passing the ‘create’ tag, the role will run apply the associated set of create tasks. Tags are a powerful construct in Ansible. Execute the following command, passing the create tag. In the case of this playbook, the Check mode, used earlier, would fail here. If you recall, this feature is not designed to work with playbooks that have steps that use conditionals that depend on the results of prior commands, such as with this playbook. 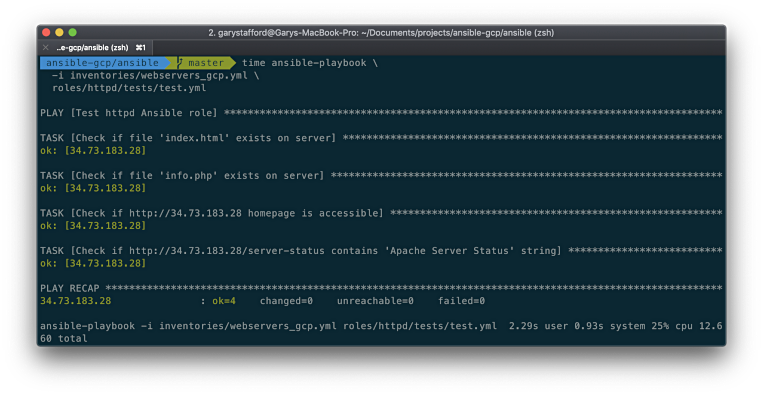 The create.yml file contains six tasks, which leverage Ansible GCP Modules. The tasks create a global VPC network, subnetwork in the us-east1 Region, firewall and rules, external IP address, disk, and VM instance (gist). If your interested in what is actually happening during the execution of the playbook, add the verbose option (-v or -vv) to the above command. This can be very helpful in learning Ansible. The output from the command should look similar to the following. Note the changes applied to localhost. Since no GCE VM host(s) exist on GCP until the resources are provisioned, we reference localhost. The entire process took less than two minutes to create a global VPC network, subnetwork, firewall rules, VM, attached disk, and assign a public IP address. All GCP resources are now provisioned and configured. 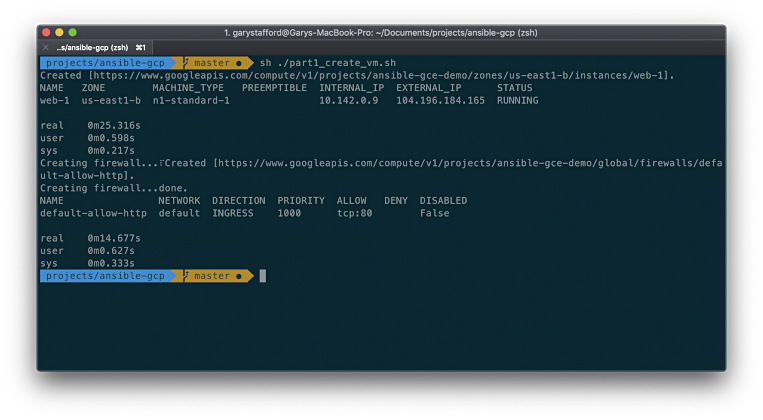 Below, we see the new GCE VM created by Ansible. Below, we see the new GCE VM’s network interface details console page, showing details about the VM, NIC, internal and external IP addresses, network, subnetwork, and ingress firewall rules. Below, we see the VPC details showing each of the automatically-created regional subnets, and our new ‘ansible-subnet’, in the us-east1 region, and spanning 14 IP addresses in the 172.16.0.0/28 CIDR (Classless Inter-Domain Routing) block. To deploy and configure Apache HTTP Server, run the httpd role exactly the same way we did in the first workflow. In the first workflow, we manually tested our results using a number of ad-hoc commands and by viewing web pages in our browser. These methods of testing do not lend themselves to DevOps automation. A more effective strategy is writing tests, which are part of the role, and maybe run each time the role is applied, as part of a CI/CD pipeline. Each role in this project contains a few simple tests to confirm the success of the tasks in the role. First, run the gcpweb role’s tests with the following command. The playbook gathers facts about the GCE hosts in the host group and runs a total of five test tasks against those hosts. The tasks confirm the host’s timezone, vCPU count, OS type, OS major version, and hostname, using the facts gathered (gist). The output from the command should look similar to the following. Observe that all five tasks ran successfully. Next, run the the httpd role’s tests. Similarly, the output from the command should look similar to the following. The playbook runs four test tasks this time. The tasks confirm both files are present, the home page is accessible, and that the server-status page displays properly. Below, we all four ran successfully. To observe what happens if we apply a change to a playbook, let’s change the greeting variable value in the /roles/httpd/defaults/main.yml file in the httpd role. Recall, the original home page looked as follows. Change the greeting variable value and re-run the playbook, using the same command. The output from the command should look similar to the following. As expected, we should observe that only one task, deploying the home page, was changed. Viewing the home page again, or by modifying the associated test task, we should observe the new value is injected into the Jinja2 template file, index.html.j2, and the new page deployed correctly. Once you are finished, you can destroy all the GCP resources by calling the 10_webserver_infra.yml playbook and passing the delete tag, the role will run apply the associated set of delete tasks. With Ansible, we delete GCP resources by changing the state from present to absent. The playbook will delete the resources in a particular order, to avoid dependency conflicts, such as trying to delete the network before the VM. Note we do not have to explicitly delete the disk since, if you recall, we provisioned the VM instance with the disks.auto_delete=true option (gist). The output from the command should look similar to the following. We see the VM instance, attached disk, firewall, rules, external IP address, subnetwork, and finally, the network, each being deleted. 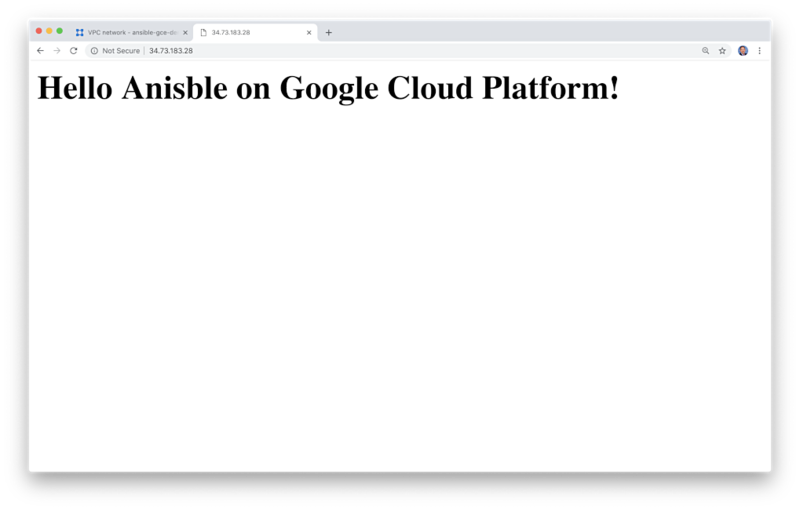 In this post, we saw how easy it is to get started with Ansible on the Google Cloud Platform. Using Ansible’s 300+ cloud modules, provisioning, configuring, deploying to, and testing a wide range of GCP, Azure, and AWS resources are easy, repeatable, and completely automatable.